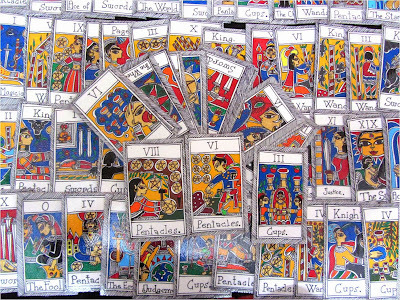 * Tarot cards have been first discovered in 15th century Italy and used as regular playing cards. 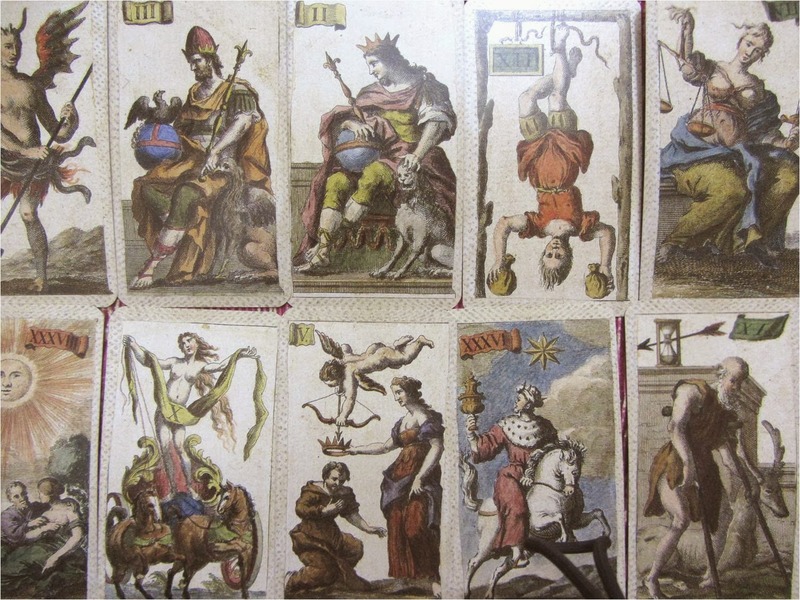 They are still used in Italy and called tarocchi. 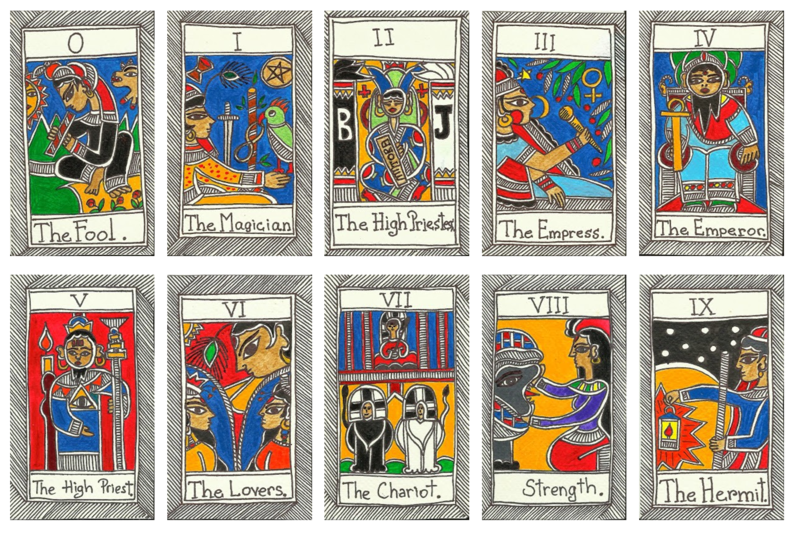 * Tarot cards differ from playing cards only because they have 22 extra cards called Major Arcana. 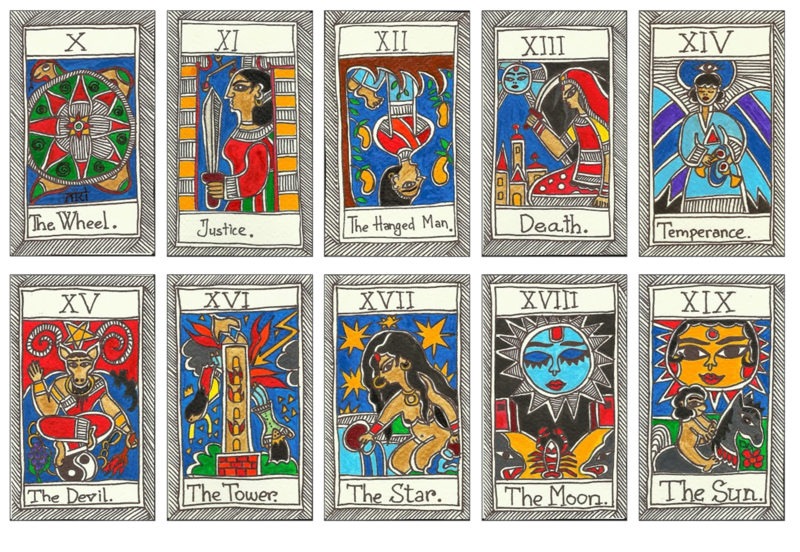 Arcana means "secret" and the 22 cards often illustrate the 22 stages of human life. * Sometimes people are scared of Tarot because they have such names as "Death", "Devil" and some others. 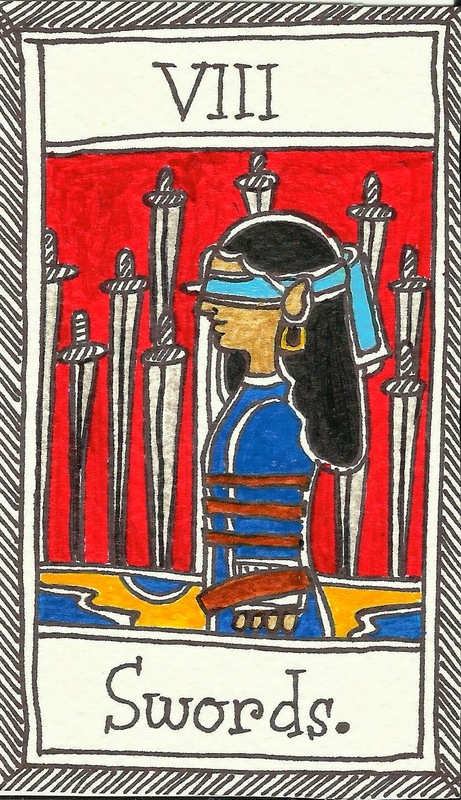 * The Tarot deck also has 4 extra face cards that are called "knights". 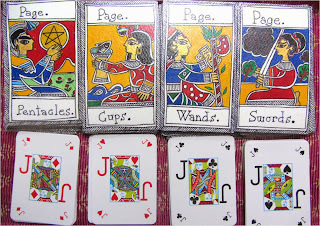 * The Tarot Deck differs from the playing card deck with the number of cards that it has. 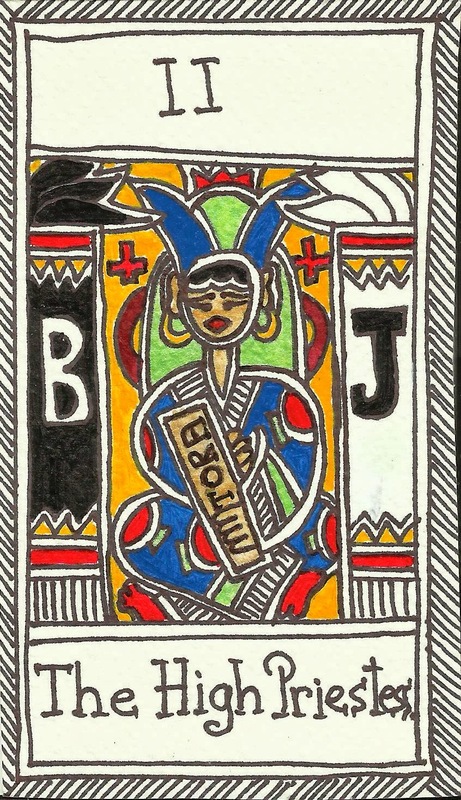 The Tarot deck has 78 cards and the playing card deck has 54 (52 without 2 Jokers). 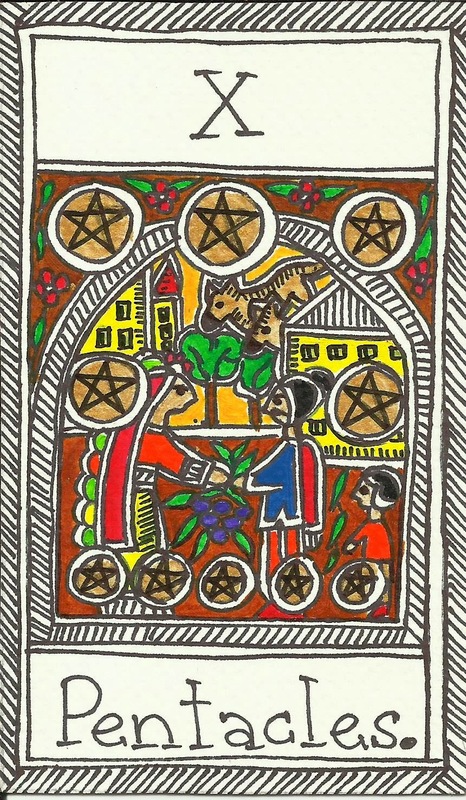 The Tarot card would use Wands, Cups, Swords and Pentacles instead of Clubs, Hearts, Spades and Diamonds. 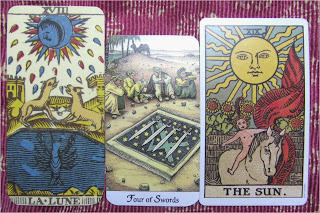 Tarot cards in Europe are the most famous future telling tool. 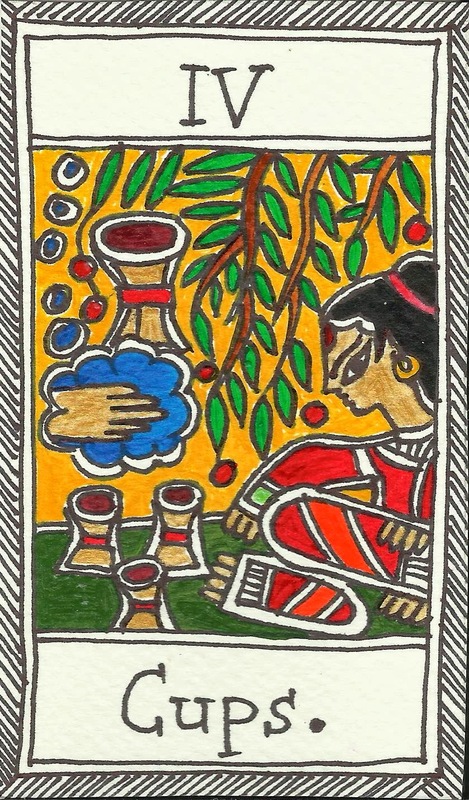 Tarot reader would use coincidentally chosen cards to answer the seeker's question. 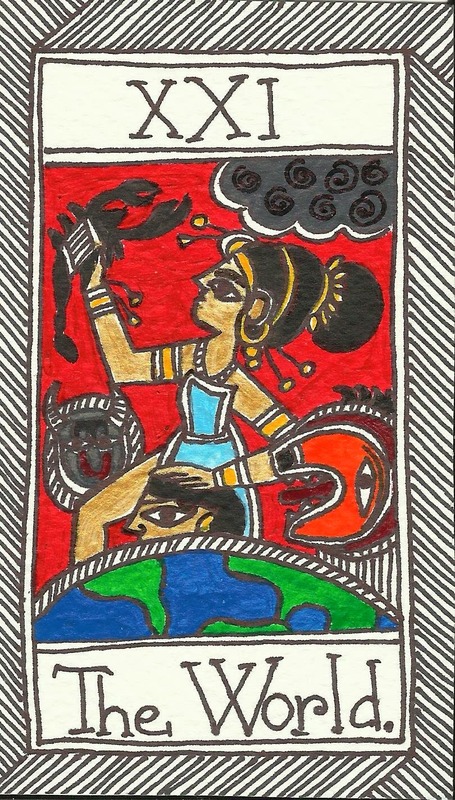 The reader could base his/her reading on astrology and numerology, the interaction of the four elements fire, water, earth and air or he/she could simply describe the card meanings or keywords. Each reader would have different methodology. 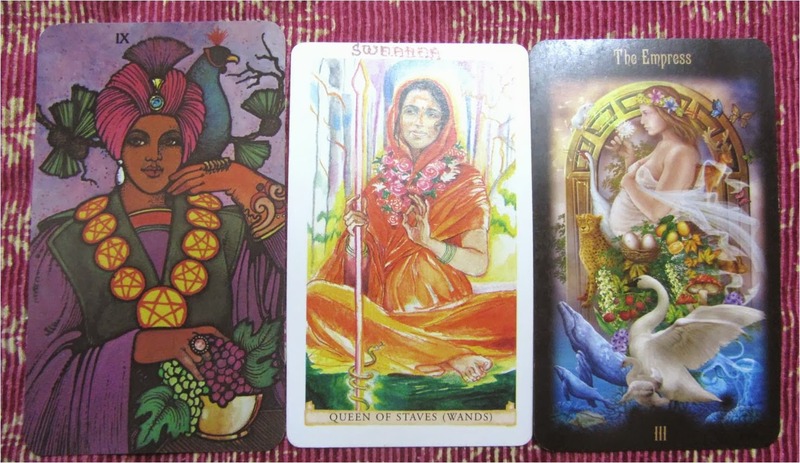 An intuitive reader would base his/her readings on the images reflected in the cards. No one has to be any special to read cards. Everyone can do it. Some might do it for fun, some might take it more seriously, some use cards for meditation and even spells, some use their cards once in a month and some might study to become professional readers. The factor that differentiates between these levels or proficiency is the time devoted for practice. Even in fortune telling, practice makes perfect. 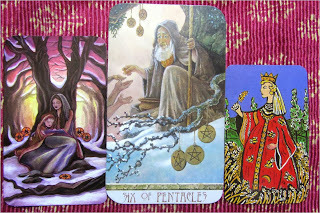 Another important thing that Tarot contributes to create a wide niche for the world's artists to show off their art. 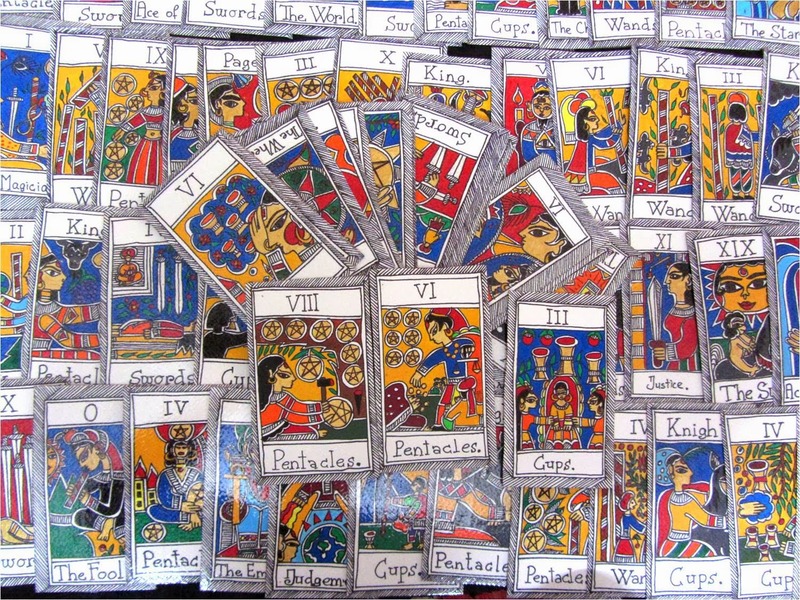 There are thousands of Tarot decks created every year and big business runs with the help of those who buy them. 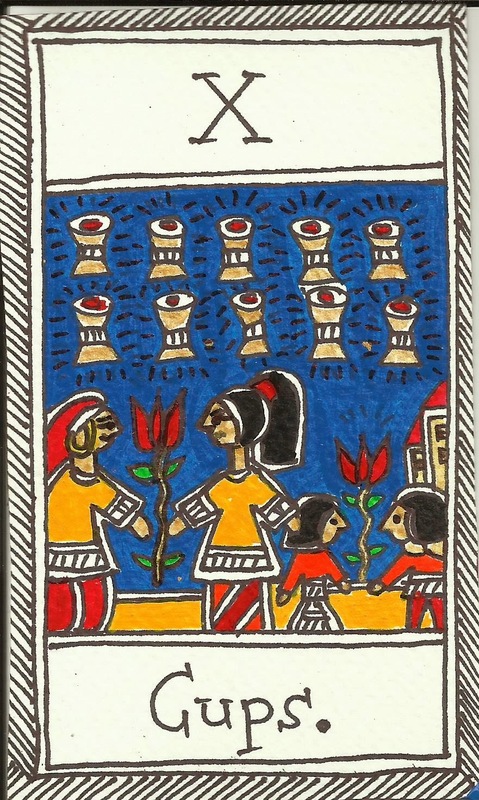 Tarot art can be enchantingly beautiful and for many Tarot readers and collectors - very hard to resist buying from. 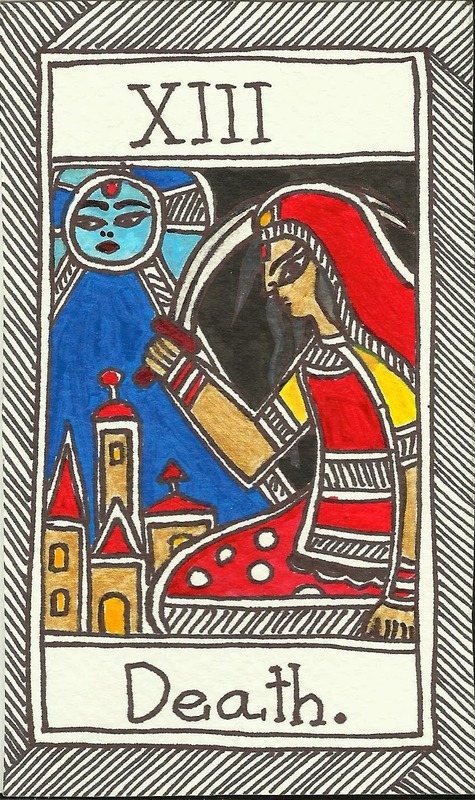 There are decks on every theme that one can imagine such as housewives, elves, fairies, English, Japanese, Chinese, Egyptian, Indian, dragons, African American, One Thousand and One Nights, Rumi, Manga, Russian, Da Vinci and many more. From left to right: "Crystal Visions Tarot" (US Games); "Druid Craft Tarot"; "Jonathan Dee Tarot"
Buying a Tarot deck can be quite expensive. 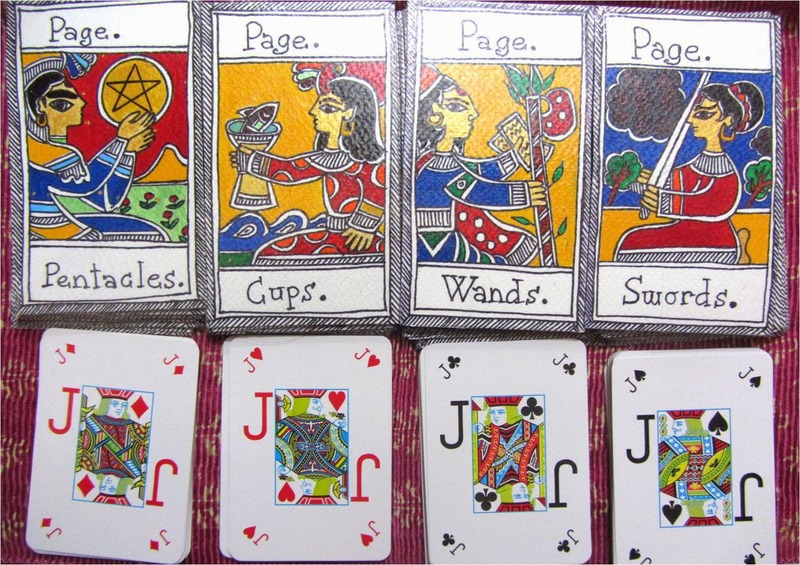 Usually themed decks range around RS 1300-1600. 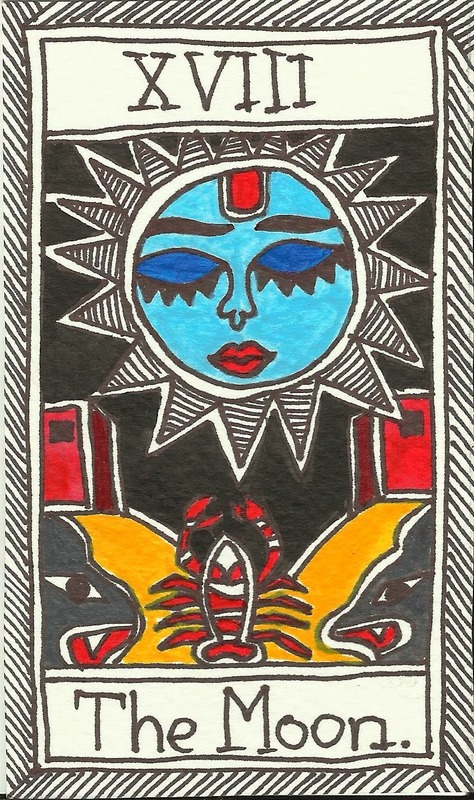 So, I thought, why not make your own Tarot deck? 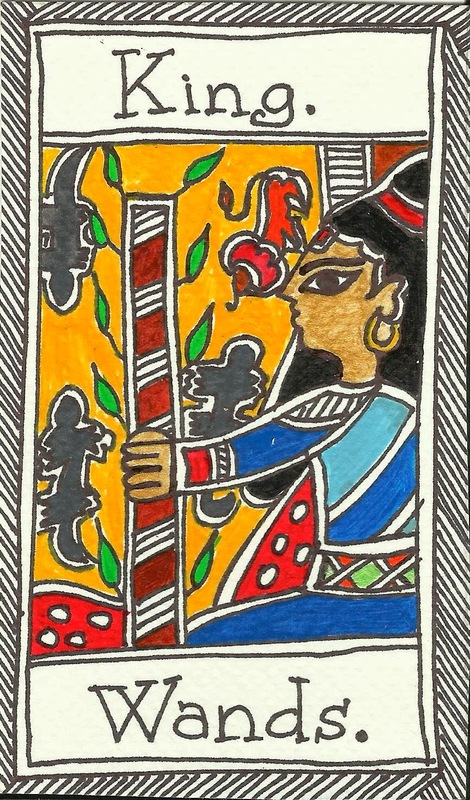 In this post I am going to show the Madhubani deck I've made during one year (slowly and when in a mood). You can print it out and stick the images on the fronts of the playing cards and then "laminate" them using a broad cello tape (sticky tape). 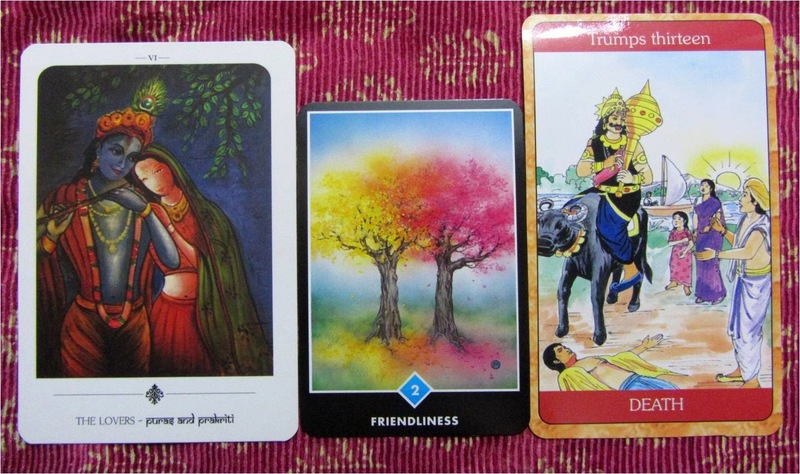 Left to right: "Sacred Indian Tarot" (Kiren Rai); "Osho-Zen"; "Indian Tarot Cards"
To tell the future from cards is called to read the cards. The person who reads cards is called the reader. 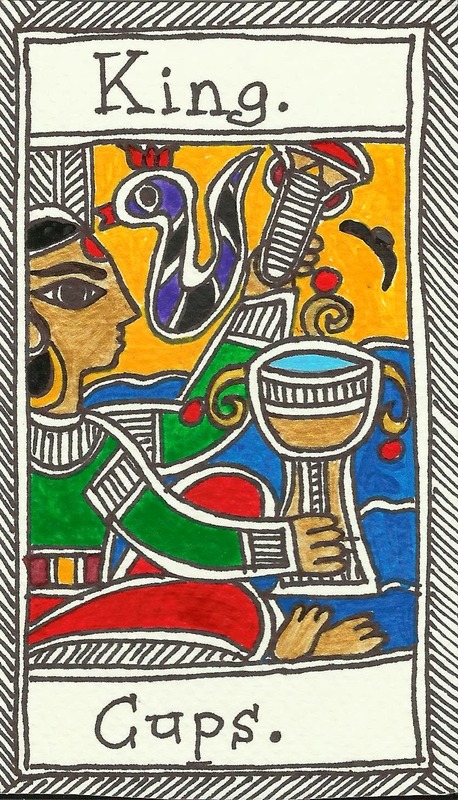 The person who wants his cards read is called the seeker/the querrent or the client. 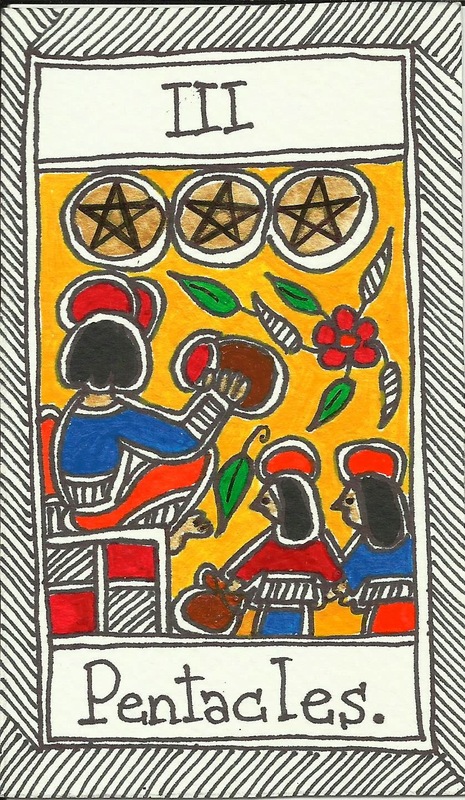 The process of reading the cards is called "the reading". 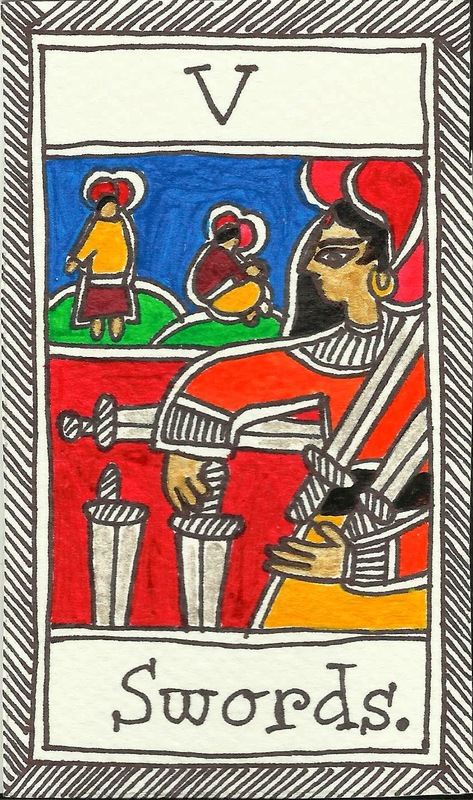 The design in which the cards are layout is called "the layout" or "spread". 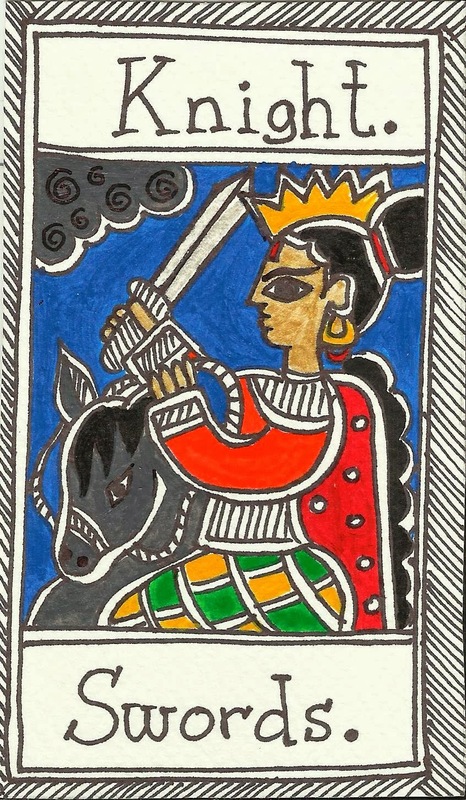 MADHUBANI TAROT DECK BASED ON THE MOST POPULAR TAROT DECK - RIDER WAITE SMITH. 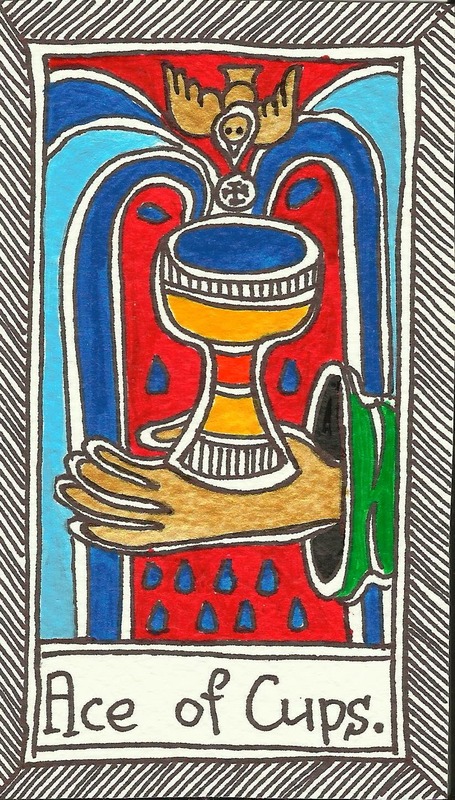 This is the suggested Tarot card back design. (The FOOL is like the playing card Joker. It's unpredictable, it lives in euphoria, he is surrounded by carelessness and trust in life. He may seem like a fool but in reality he is a free spirit who is able to wonder the world as he pleases. He is strong because he has no attachments. He may seem as if he lives in a dream world and could be compared to a poor old villager sitting on a stone, having no home, no teeth and still smiling. FOOL might be a soul traveler, going from life to life carelessly. If he wasn't careless and confident he couldn't do anything! This FOOL is everyone of us. 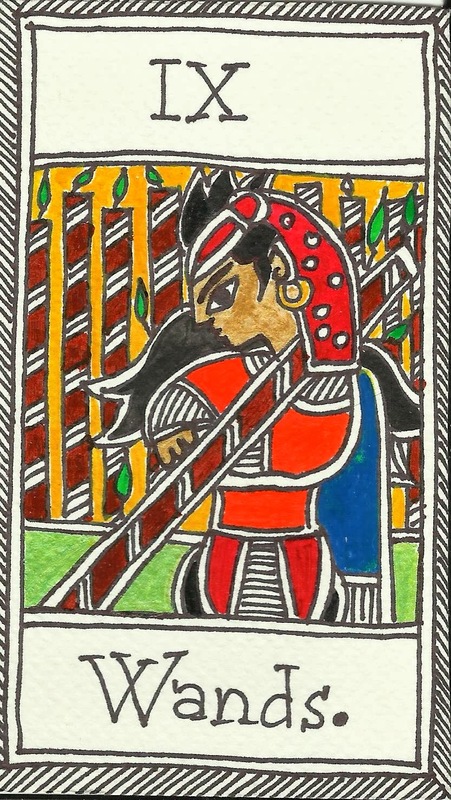 When I get the FOOL card I would usually feel that I should take life a little less seriously, be a little childish and confident either like a child who pursues an enormous dream or a drunkard who can hardly walk but is sure nothing will happen to him. 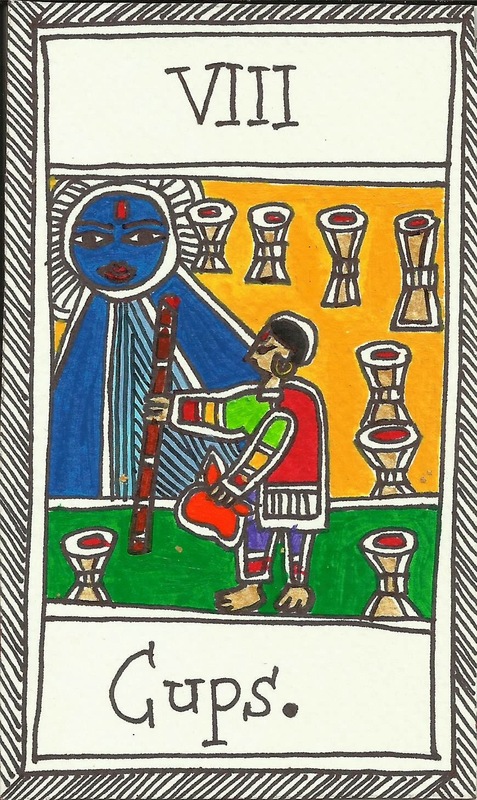 If this card appears in a reading that is predominated with more problematic cards, I would assume the FOOL means "be careful", it's not time to act in a relaxed free spirit way. Maybe it would be better to be a little more practical and use some logic when thinking). (The MAGICIAN is an expert in all things material. He is always at work and he possesses knowledge about how to bring ideas to life, how to manifest dreams and desires. 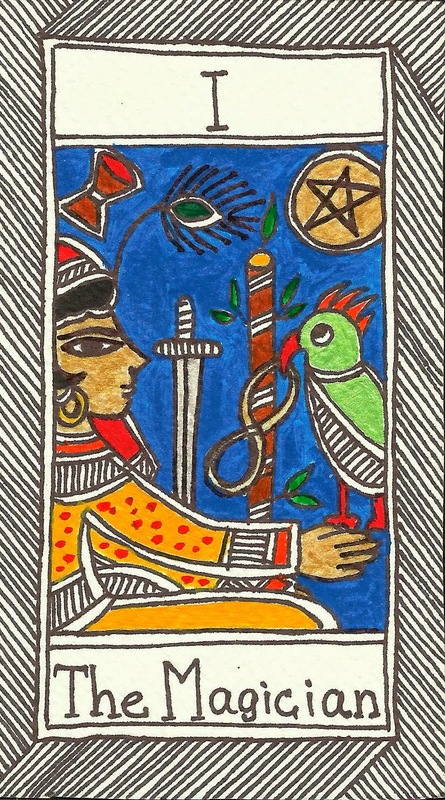 He has a cup, a pentacle, a wand and a sword with him that symbolize the four elements: water (cup), earth (pentacle), fire (wand) and air (sword). The magician is probably a wise-man, a scholar, an alchemist, a trickster and a magician. 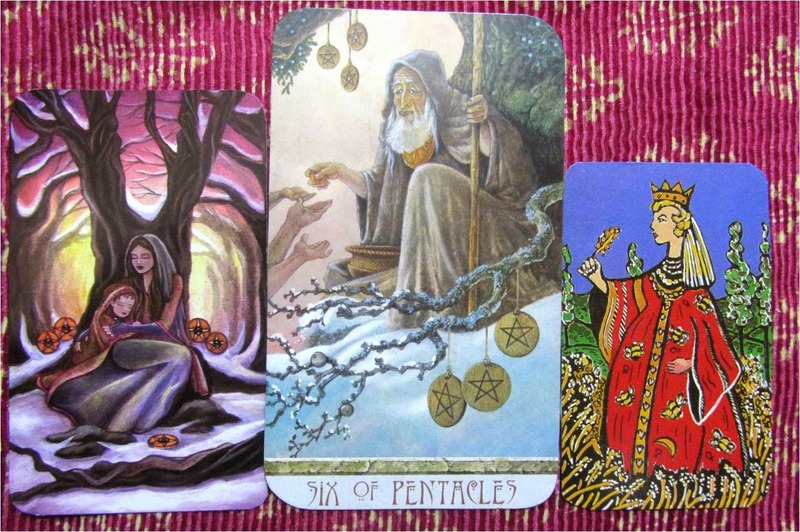 If I get the MAGICIAN in my reading I usually think that I am given the advice to trust my own abilities to achieve something. It's as if I had skills or knowledge but I'd overlook them. I also think that MAGICIAN card can symbolize an extremely successful person who is doing well in career, relationships and makes his material world spin fast and smooth around him. It's someone who knows how to apply his inner strengths and skills in order to achieve what he wants in the material world. (The HIGH PRIESTESS is often compared to MAGICIAN and is said to be its feminine counterpart. 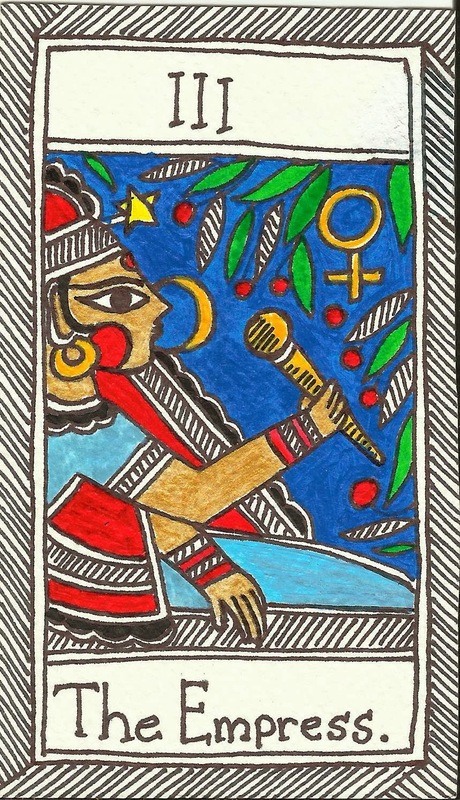 Feminine in Tarot usually means "inner". 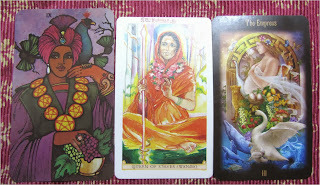 So The HIGH PRIESTESS represents intuition, inner knowledge and what's hidden inside. The feminine HIGH PRIESTESS would not try to work on and manifest her inner powers into material ones because she'd rather BE. She is stillness and being. 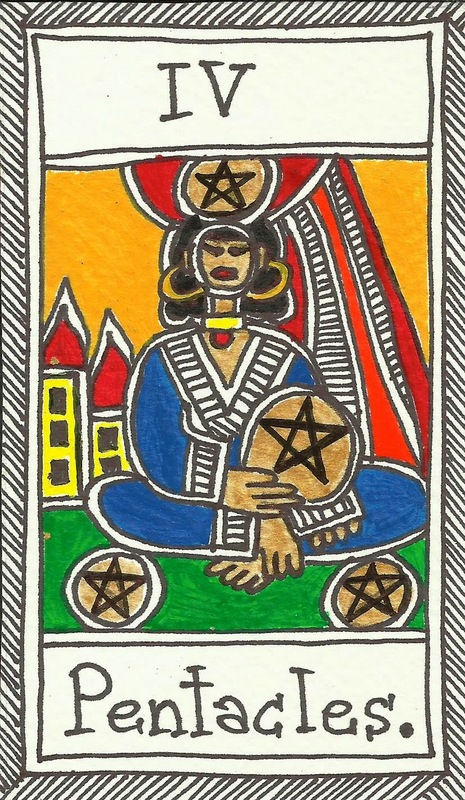 When the HIGH PRIESTESS appears in my reading, I either think of a heavenly being trying to help me out (such as goddess or deity) or a sign to look within. It would not be a simple sign to look within but it would be inner power and spiritual knowledge and enormous intuition that I am asked to trust that is within me. I also think this card could mean the spiritual side of everyone of us, our soul and the wisdom that we inherited from the past lives. 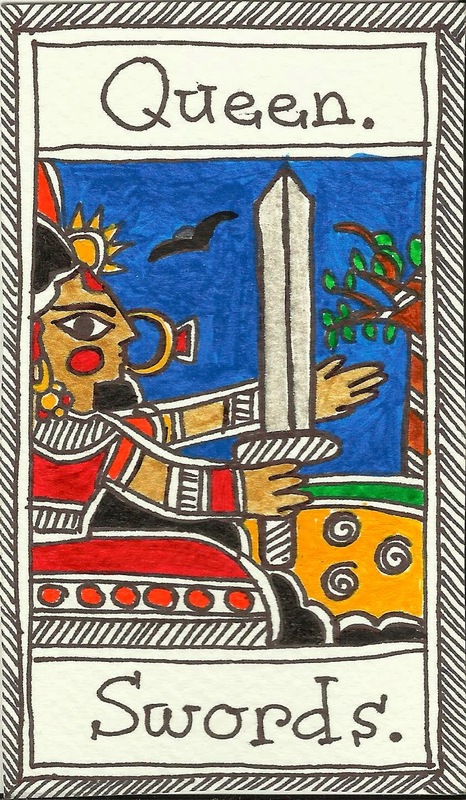 (The EMPRESS is always portrayed as a motherly woman surrounded by fertility symbols. She also is often depicted pregnant and in nature. For me EMPRESS is the embodiment of fruitfulness, success, fertility, comfort, rich natural things, care and whatever one could connect with the word "MOTHER". 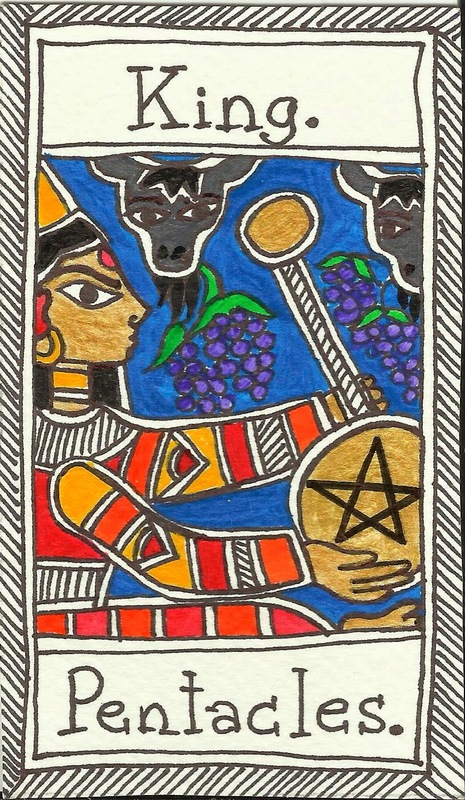 The appearing of this card may mean that there will be abundance, the projects will work out, there would be richness and fulfillment experienced. It may mean pregnancy and childbirth, big amount of creative ideas, huge potential and everything that can fit in her fat tummy. (If the Empress is the MOTHER figure then EMPEROR is the FATHER figure. However this EMPEROR is the old fashioned FATHER figure and everything we can relate to it. He is authoritative, strict, wise and experienced, old fashioned and rigid, has his own opinion, doesn't want to hear yours. He is not very flexible and he likes things to happen according to the old order. In any case the EMPEROR has a soft side and he would always be willing to provide a solid support, help or advice. 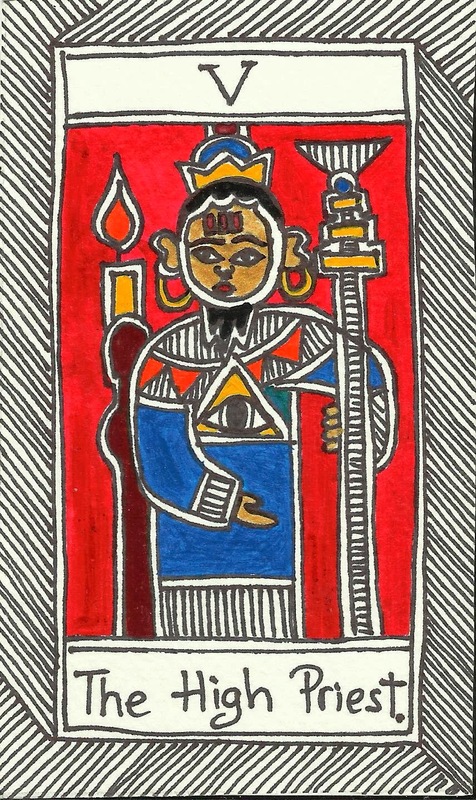 When I get EMPEROR card in my reading it would usually represent a person from outside, a stranger who I could ask help or advice from. It could be a lawyer, a doctor, a professor or a relative who has reputation for helping and supporting everyone. This card may indicate that I need to consult someone who is professional. (The HIGH PRIEST would represent be the religious head, the head priest, the head saint, the Pope. He would represent tradition and old order. When I get the High Priest, I would think that the cards would be talking about something traditional or old fashioned or commonly accepted. The high priest could also refer to "others" and peer pressure. 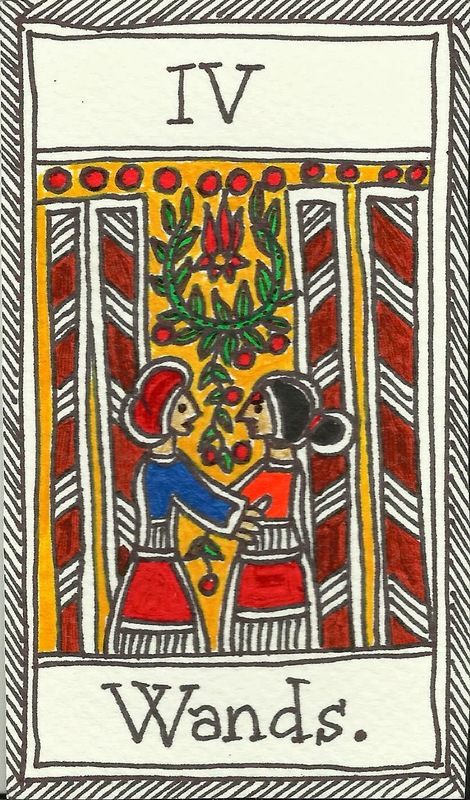 (The LOVERS traditionally mean making a choice. They are the lovers but there is the third person in the card. This person might be the male's mother or it might be the other woman. This represents a difficult choice in life. The other meaning could be simply meeting your soul-mate, the second half, getting along with someone very well or things going in a perfect balanced way. Projects working out just right and there is some chemistry about positiveness of how things happen. It depends on the context what I think when I get the LOVERS card. Usually for me it's a very auspicious card. If one does a love reading, then LOVERS are definitely symbolizing the chemistry between two people. If it's a job reading, the LOVERS would speak about the job being the right one and things going "just right" and there is the sense of "feeling in love" in it. 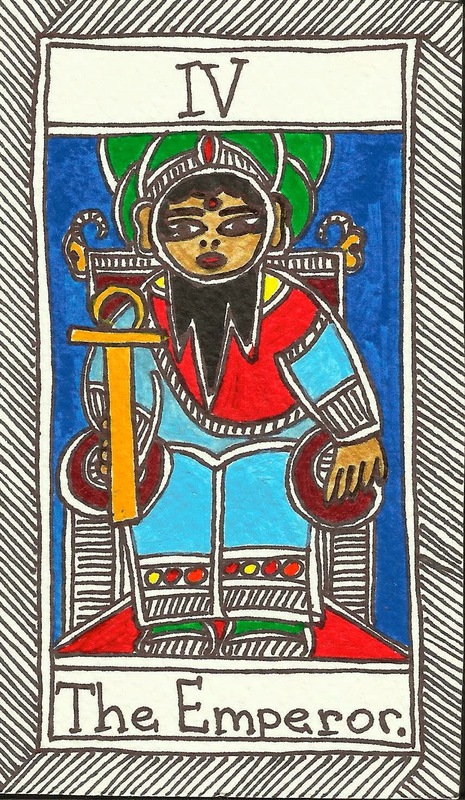 (The CHARIOT is a rider that rides two sphinxes that go into two different directions. One is black and the other one is white. They both represent conflicting qualities that one has to learn to be able to control. 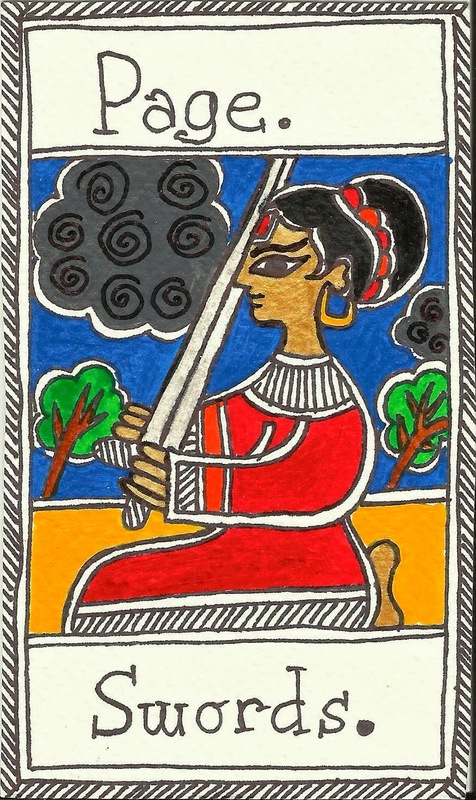 It is the card of winning over one's own inner conflicts. It can also signify moving fast towards success and being a strong player. When I get CHARIOT, I feel that it's not going to be easy but that I am going to succeed in a project or whatever I am trying to do. 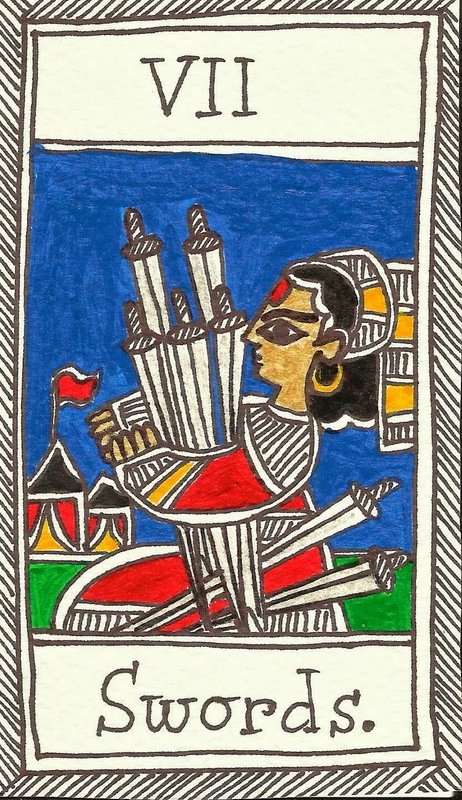 Also people who are very balanced personalities, who are responsible and tend to fulfill their duty and serve others as well as enjoy the life and be successful often are represented by this card. It's a card of success and winning. 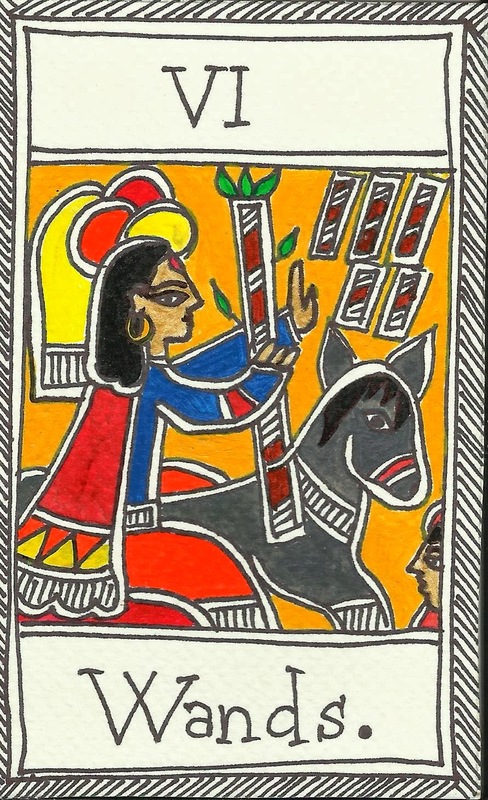 It's Arjun and Krishna riding in their CHARIOT. (I like this STRENGTH card. I like the idea of STRENGTH. 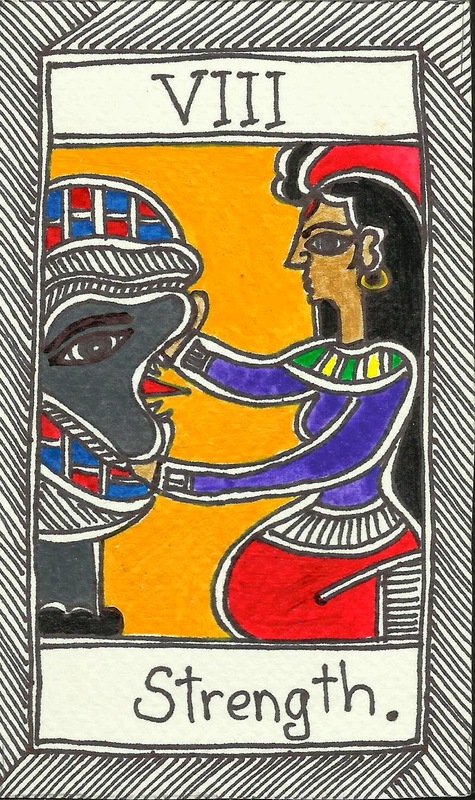 This card depicts a gentle woman opening the mouth of a lion. She is doing it with a smile and softness. This is the inner strength that manifests as the physical strength as well. When I get this card, I tend to think that I have the STRENGTH to achieve what I want. That the inner strength that I have may come to help into this situation. (The HERMIT is out at night alone with a shining oil-lamp. The HERMIT means that we need some time alone. We need to think about things or even meditate/pray. We might not be in a mood to be in any romantic relationship. It's a good spiritual time when we gather bits and pieces of ourselves or simply enjoy the silence of the night. The oil-lamp is symbolizing that this period of loneliness will do a lot of good for us. If I'd get this card, I would think I needed some time to meditate, read books or draw. It's the best thing for me at that moment. Be in peace, enjoy the silence, quiet down the mind and be still in order to understand and overcome my problems. I would also be a spiritual card for me. 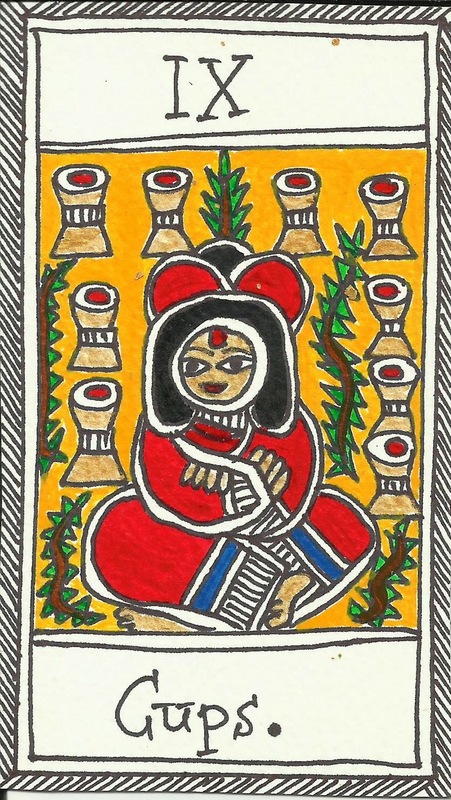 In India, the HERMIT would represent a SADHU or a YOGI. (The WHEEL is the shortened version of THE WHEEL OF FORTUNE. The WHEEL OF FORTUNE reminds of a roulette or lottery balls. It's the wheel of fate, the karma, the destiny, one of those surprising moments in life when events start unfolding unexpectedly. This card has the element of surprise. It can also mean cycles and refer to things that happen in cycles, also it can refer to the transport and travel. When I get the WHEEL, in most cases it means an unexpected change, so I should be prepared. It could also refer to anything that has wheels or is round such as car tires, wheels, motor or even the events that repeat again and again. It can also mean cycles, periods or a profession of being a driver, or in transport bossiness. (JUSTICE card mostly refers to the law, court and legal issues. It may mean visiting in court, represent court cases, documents, etc. The surrounding cards may describe in more detail what are the legal issues about and give some hints. When I get JUSTICE card and if I don't have any legal issues going on, I dwell upon the word JUSTICE and its meaning. Maybe I have to be just while making a choice, maybe I have to weigh my priorities, maybe I have to think whether I am really right or not so right. This card shows an importance of being just and right. 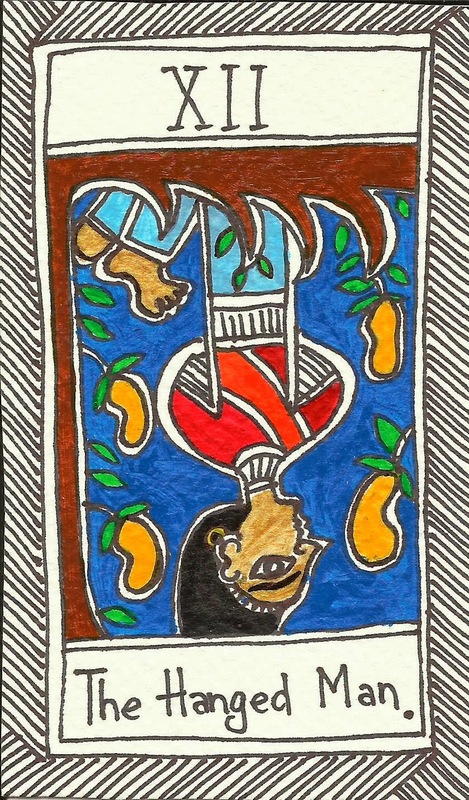 The HANGMAN is a man hanging upside down on a tree. Originally his one leg is tied to the tree as well as his arms. He seems quite pathetic and pitiful but if looking carefully into his face, we can see a clever smile. He can free himself from ropes anytime and set himself free. When I get HANGMAN in my reading, I immediately think of someone who wants to avoid something, put the things off or procrastinate. He is the guy who doesn't want to dirt his hands fulfilling his duties, take a stand or participate in some important event that he doesn't like. He is the cheeky runaway and he will be back when the time is right. It can also symbolize a person who is very clever and knows how to wait well in order to achieve the best goals. He thinks outside the box and is a great strategist. This might also refer to avoiding the conflict or waiting to get out of the hut as soon as the storm is over. The hangman can also mean self sacrificing or gift of self. Many times it can mean "letting go of control" or trusting the higher force, God. 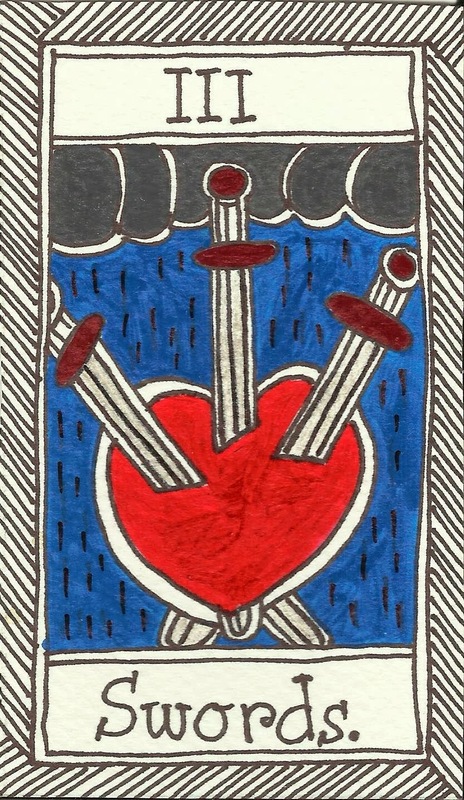 When this card appears in the negative context, it would only accentuate the original meaning. It would mean we would need more of HANGMAN at this time or that we've been HANGMAN for too long and it's not working for us well enough anymore. Many tend to be taken aback by this card. 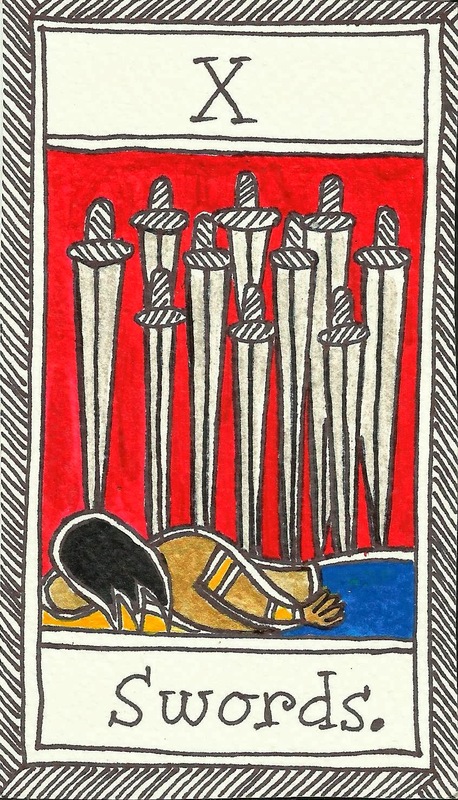 The DEATH card simply means end, transformation, time to move on, need to finish things up, end of one cycle and the beginning of another cycle. In reality, even the physical death is just a part of life, a part of never ending cycle. Death often can mean change of job, moving to another house, ending a relationship or changing one's way of thinking. Word TEMPERANCE means moderation and self-restraint. 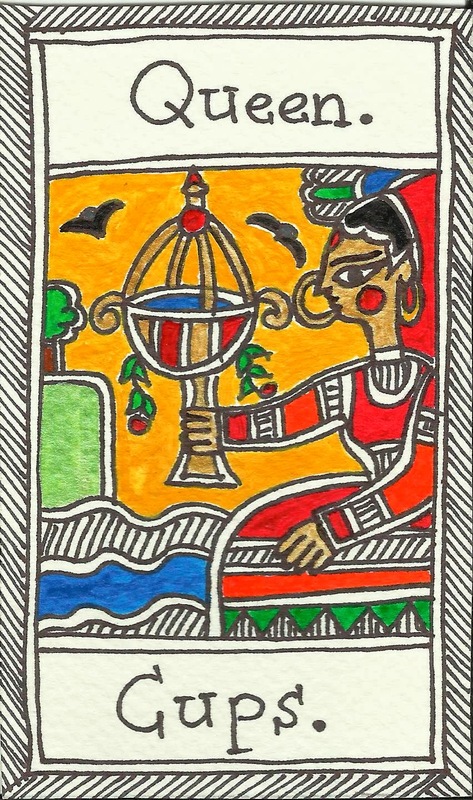 In the picture we can see an angel (pari) who is pouring water from on glass to another and she/he (as angels do not have gender) is calm and content. 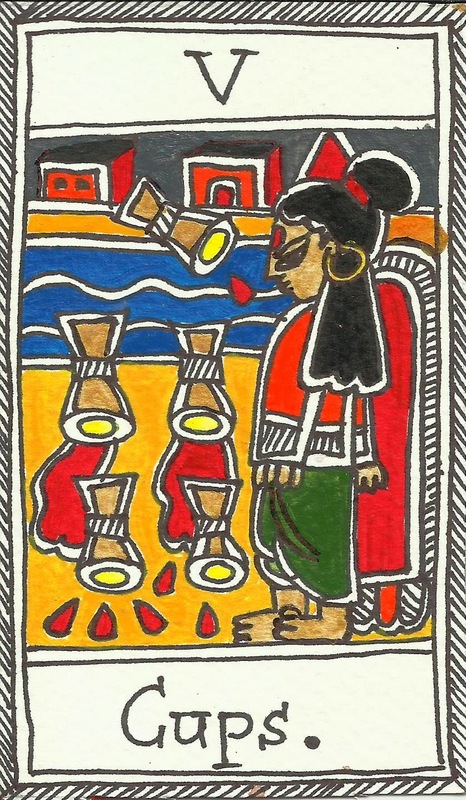 This card is about balance and it suggests that we should go about things slowly, carefully and calmly. This card can also mean delay or anything opposite to rush. 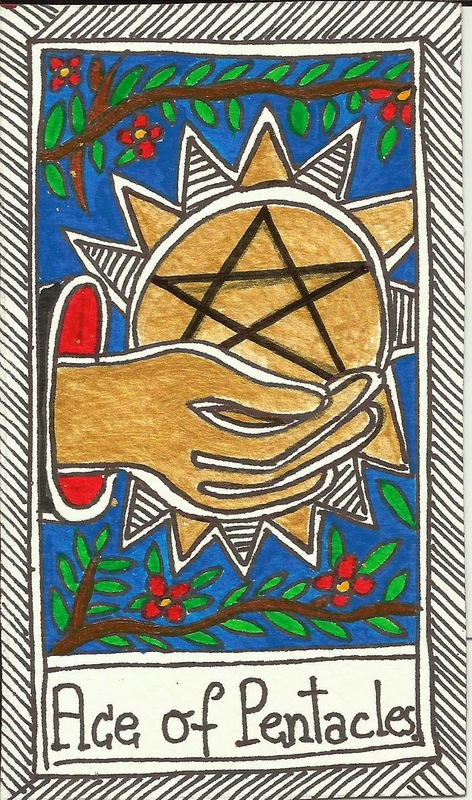 It is a card of healing, harmony and balance. 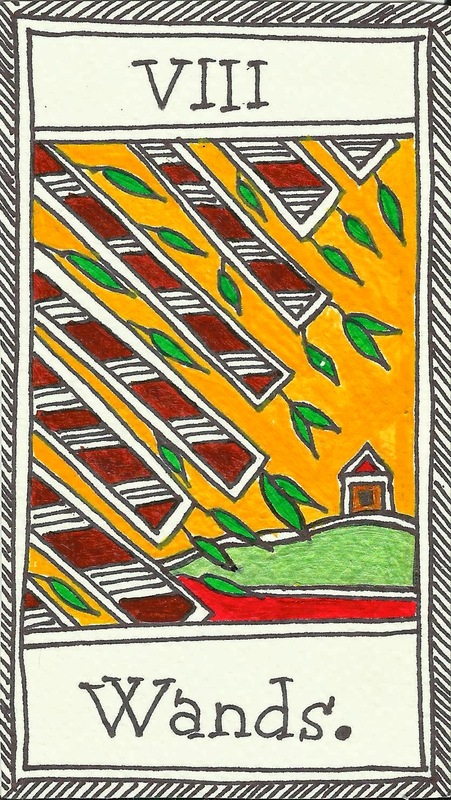 If you are ill, this card indicates healing and getting back on the track. 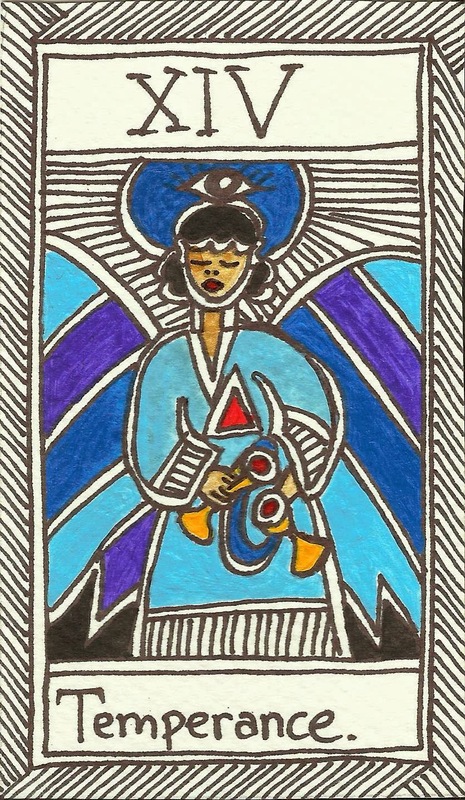 For me, this card means a healing angel (or divine being), inspiration or idea on healing and harmony. 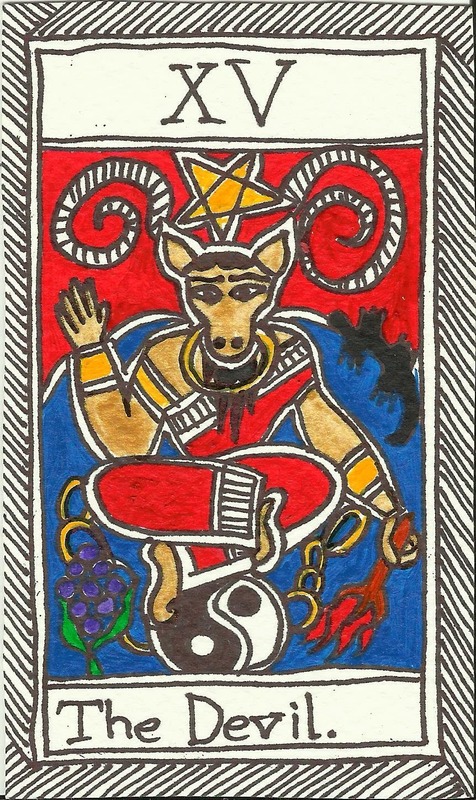 The DEVIL card is another "scary" card in the Tarot deck. The DEVIL means attachments, seductions, addictions, bad habits, things that are hard to resist, obsessions. 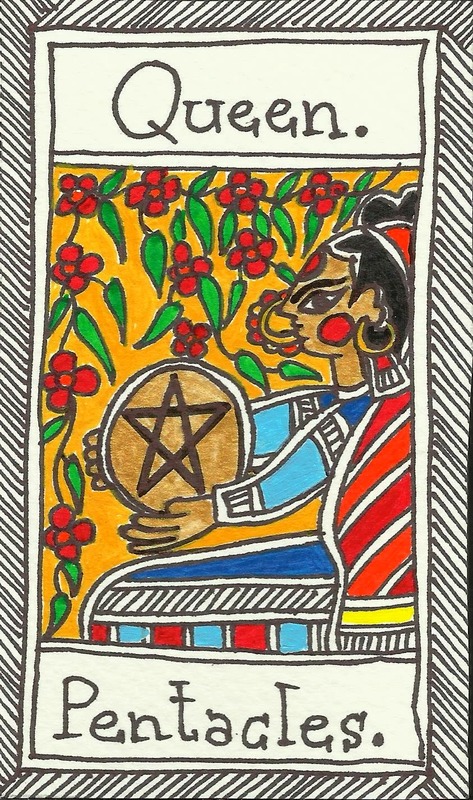 If someone is obsessed about collecting a certain thing and it might effect his finances and relationships, he/she might get a DEVIL card. 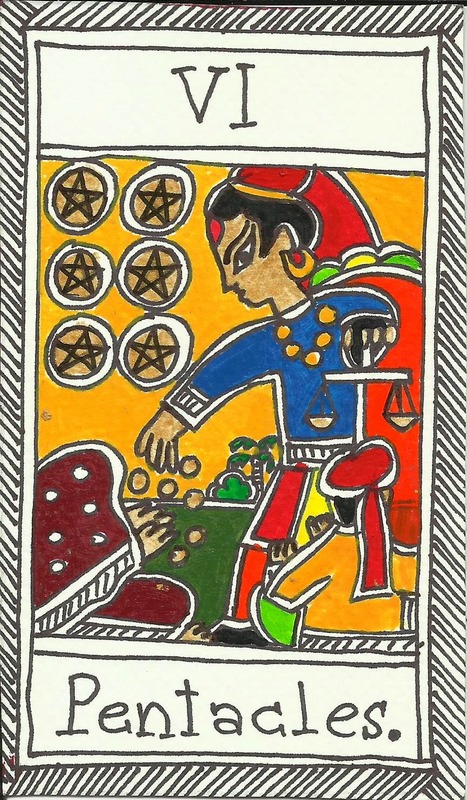 Also someone who is obsessed about money and it doesn't let him/her sleep at night might get a DEVIL card. People might get this card when they start following some goal in an obsessed manner and the goal might not be their "life path" or the goal that could harm them in some way. Such as becoming a millionaire illegally or in shady ways. 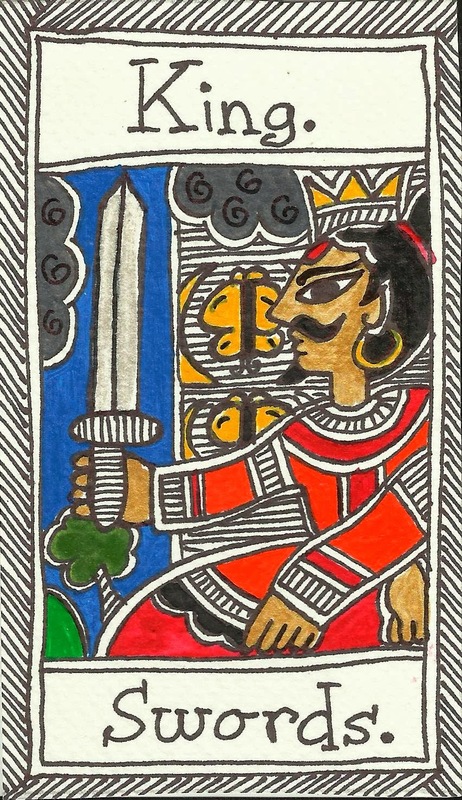 It is also the card of EGO. 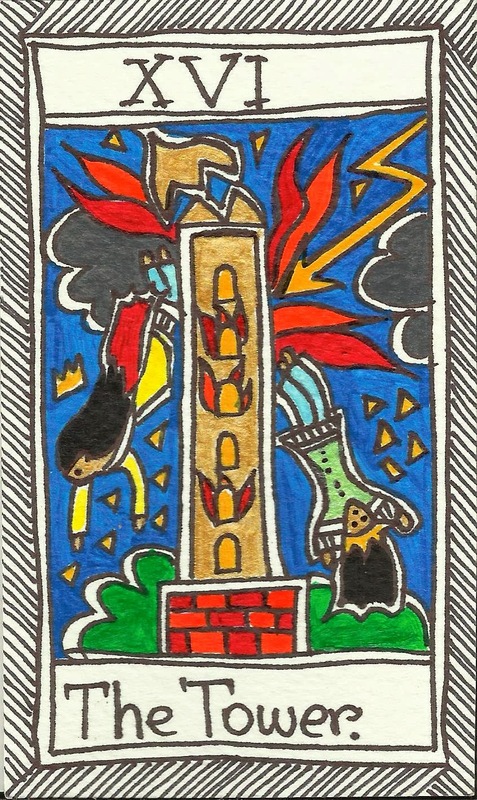 The TOWER symbolizes a high tower being struck by lighting and is sometimes also called "THE BREAKING TOWER". 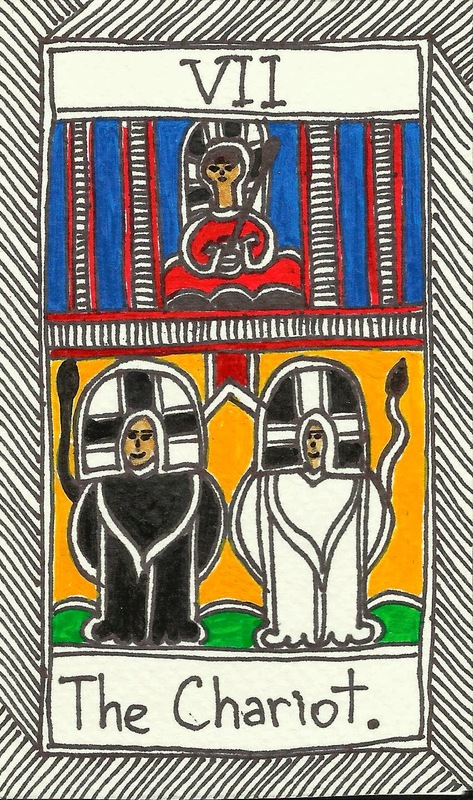 It also shows two people - a king and a queen falling down from the window. This is another thought provoking and a little unpleasant card. It reflects one of those situations in life when we create a tower of believes, habits and thought patterns from our and other people experiences. These believes and things we learnt from life have become a part of us and help us reason, debate and is the base of our thoughts and actions. I would call the TOWER "the old self". Breaking TOWER is actually a good sign. It depicts the breakage of our shell, our illusions, defenses, old believes and patterns, old job, old thought, old personality, old self. This TOWER is being struck by a lightening which is like an unexpected event, or word mouthed by the other, a constructive criticism that hurt us and sting us in a way that we rethink our foundations and ourselves. The TOWER might show an unexpected challenging event that changes our life for good. When I get the TOWER, I usually get morally prepared for an event that may affect my future. 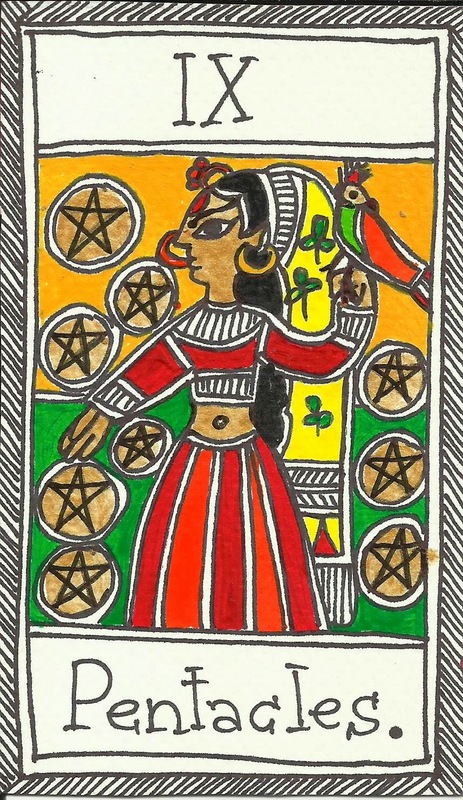 The STAR is said to be one of the best cards in the deck. 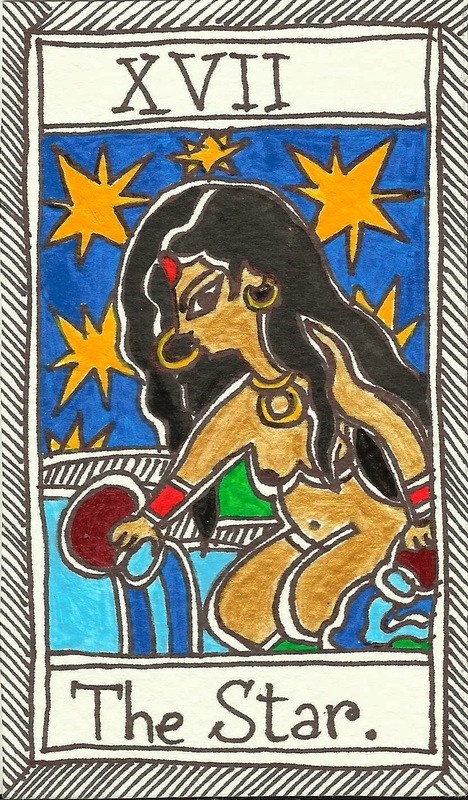 The STAR depicts a woman near the lake who is pouring one jug of water in the lake and the other - on the grass. It means hope, wish, belief, faith, optimism, positivism, inspiration. 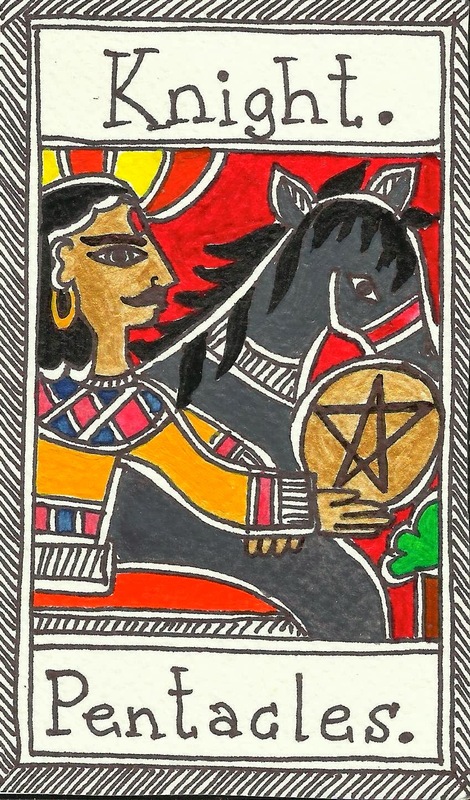 This card indicates that you are on the right track, it affirms your intentions saying that they are right and you're getting the divine support. 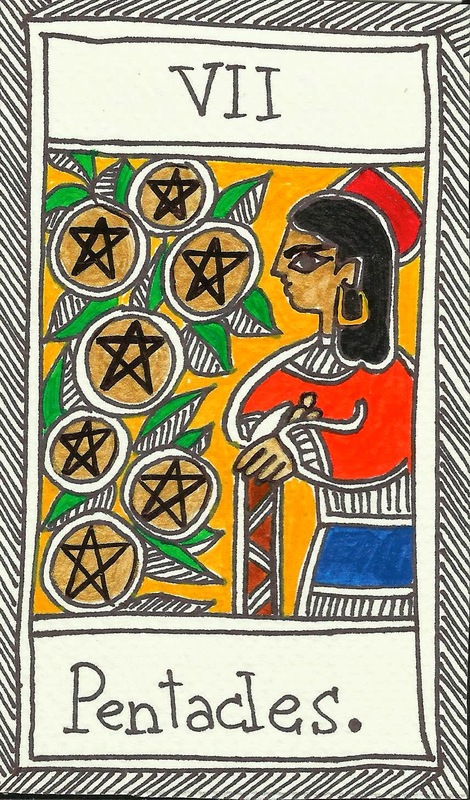 The STAR card is a guarantee that your wish can be fulfilled so get on with it! Keep dreaming, hoping and wishing - this wish is totally harmonious and the goal - achievable. 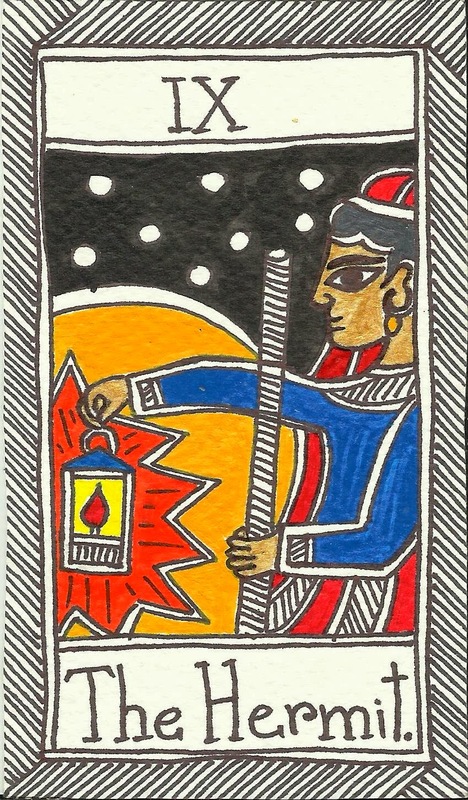 The MOON card usually depicts something that is hidden and shady. It can tell about our fears and hidden anxieties that do come in a way when living a life. 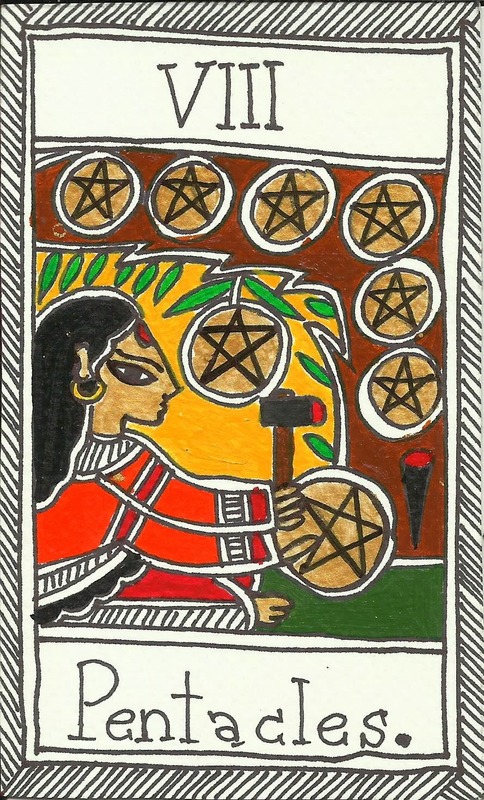 This card may also signify dreams, visions and special abilities. When doing an intuitive reading, it may represent night, moon, the night when the full moon was out, mysterious and hidden secrets or the other side of matter, the shadowy side of a person or situation. If I get the MOON card, I think it tells me to look deep down inside and reevaluate my feelings and attitude. If it's a fear, where does it come from? I also think, that depending on the other cards the MOON may mean the fear of darkness, being "afraid" to move on because of some deep psychological reasons that might need to be dug out. 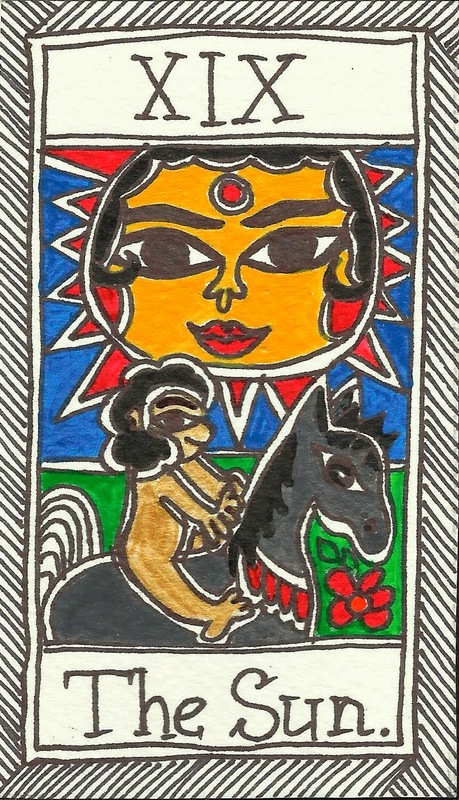 The SUN is one of the best cards in the deck and for me it symbolizes, good luck, joy, the feeling of relief, happiness, good things that happen easily and effortlessly. 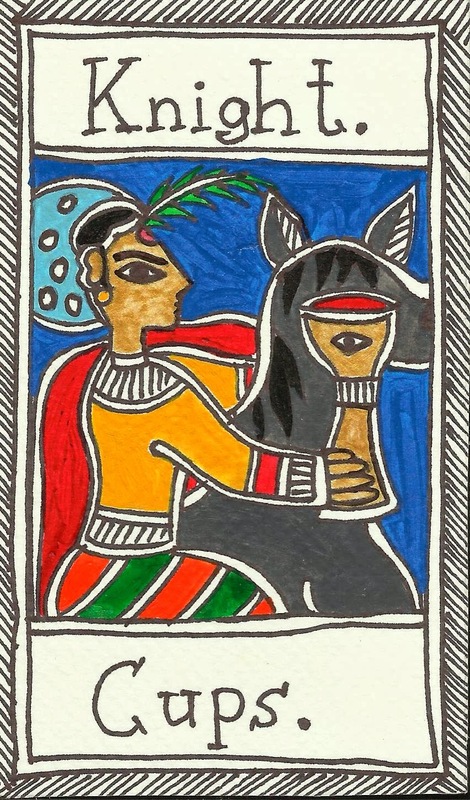 As we have a child sitting on the horse, it also means innocence (even pregnancy with other good cards) or a child. 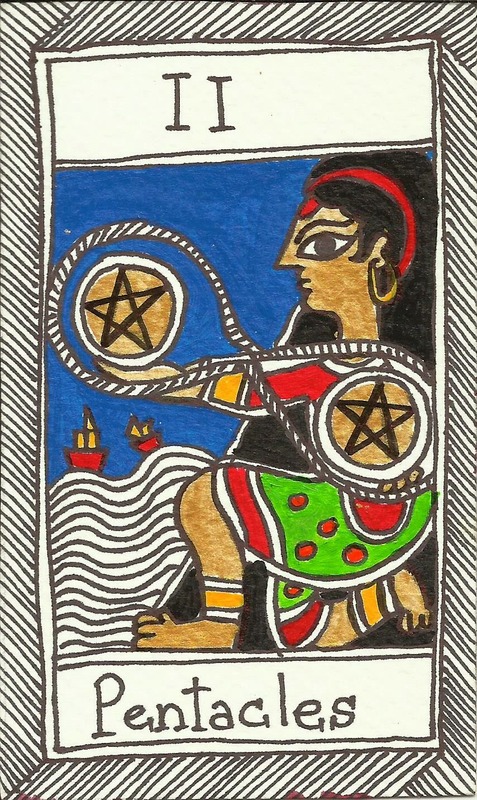 This is the card of extreme well being, enlightenment and all things that bring joy, laughter, happiness and fun. It means pleasant experiences, public recognition and great results. 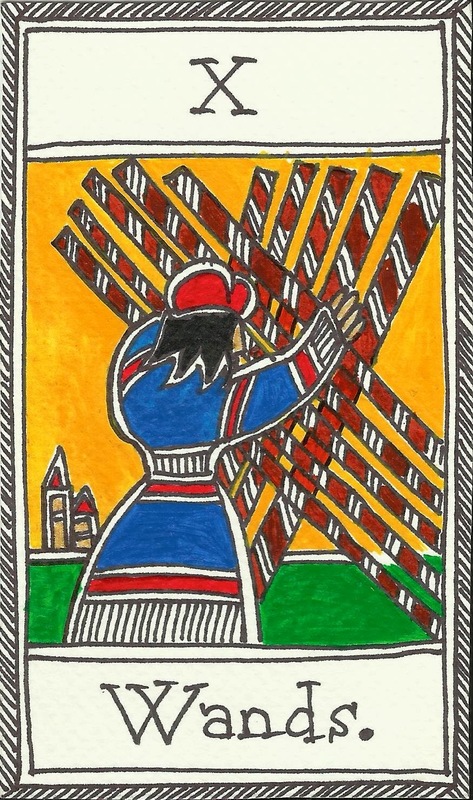 Another card for "being on the right path" and things going better than expected. 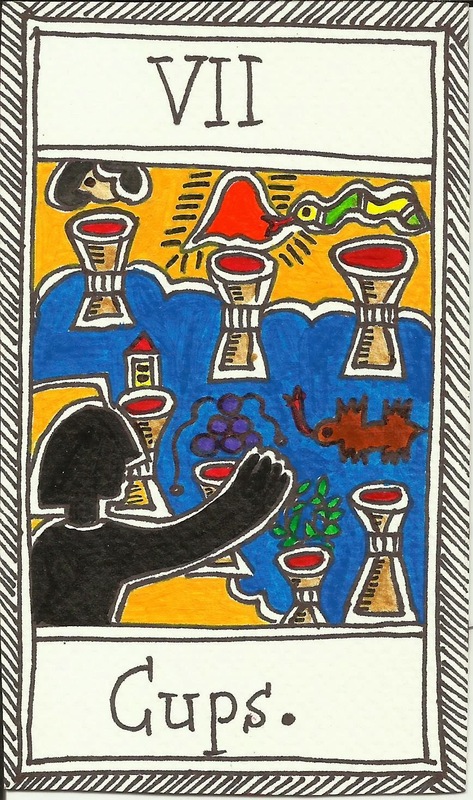 The JUDGEMENT card refers to The Last Judgement of Christian religion. The Last Judgement is often associated with the end of the world and natural cataclysms. It is said that all dead (Christianity usually does not talk about reincarnation) will be made alive again and "judged" by the God. Those who were nice people will go to heaven and those who were bad people - to hell. 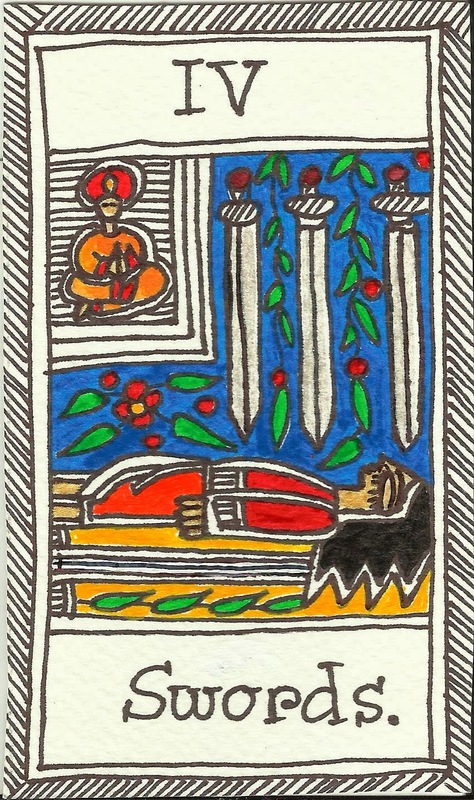 The traditional image shows corpses rising from coffins and stretching out their arms into the angel holding a trumpet above them. JUDGEMENT is associated with being waken up from the death and all the emotions related to that. 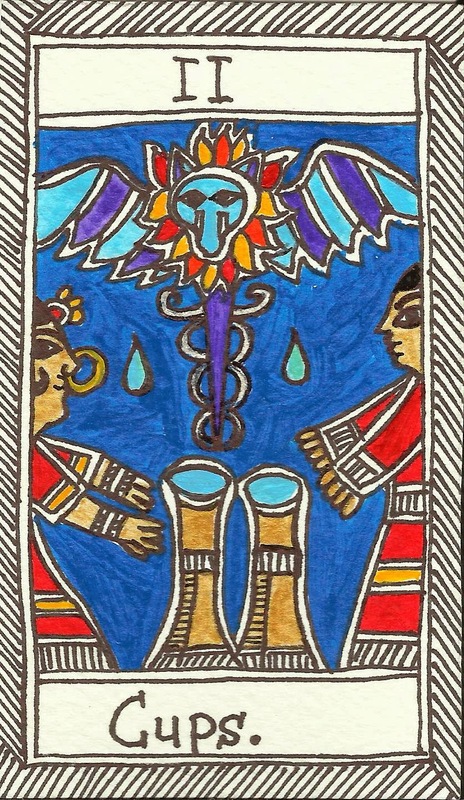 Because the angel is holding a trumpet that causes all the dead rise, the card's meaning could be a wake up call, an invitation to change, wake up, keep going, make a decision. It is rebirth, renewal and it's a warning about an upcoming change, end and a new beginning. 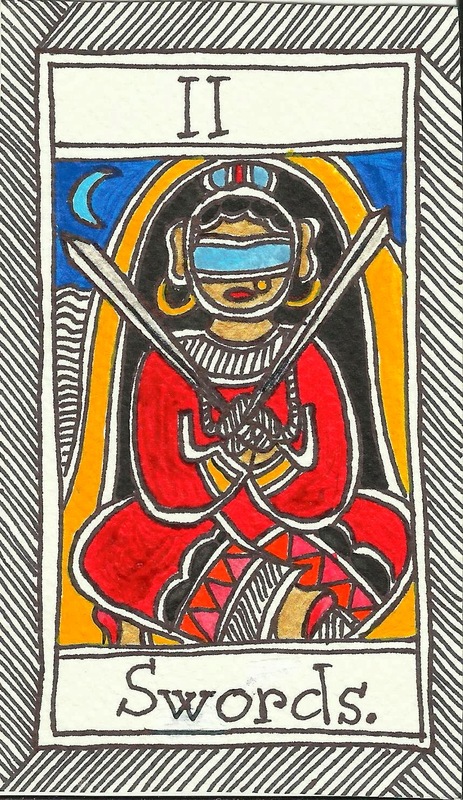 I didn't want my JUDGEMENT card to look so religious so I simply depicted what JUDGEMENT means to me and how I imagine it. I imagine that after the death we will simply be ethereal energy bodies who sense, see and feel rather differently but the communication will be active. So "the god judge" will be a consciousness (most probably our own, like it is now) and it will offer us healing and wisdom rather than "judging". It will transform us in a way that we will be able to continue our life in the realm of the afterlife. Two people represented in this picture are rather keen to experience the judgement and the Earth is depicted because now they can see their life from a different perspective. They can see the full picture. 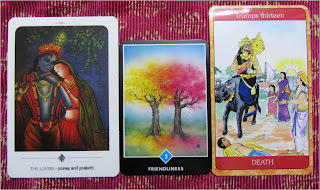 So if the JUDGEMENT card appears in my reading, I tend to get excited and happy. I know that something new is about to start and that is something profound. It also tells me I should release all negativity in order to move forward. 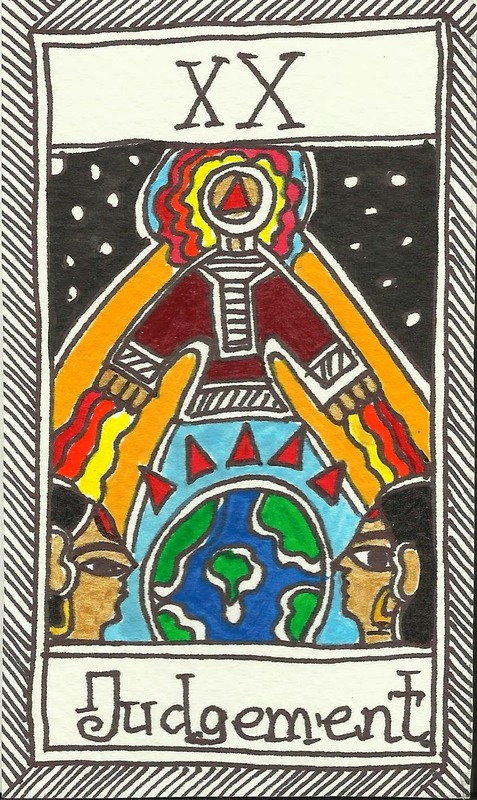 The WORLD is the last Major Arcana card it symbolizes completion, accomplishment and fulfillment. 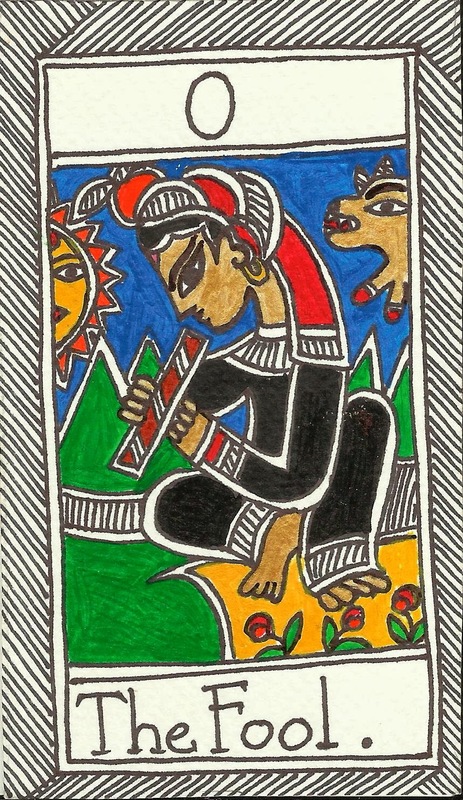 If the FOOL card represents us, the seekers, so the WORLD card is where his/her journey finishes. Getting the WORLD card might mean that goals are achieved, dreams fulfilled, missions accomplished. There is an inner contentment, happiness. It is the card of success and good in everything whatever there is. The task is to enjoy results. 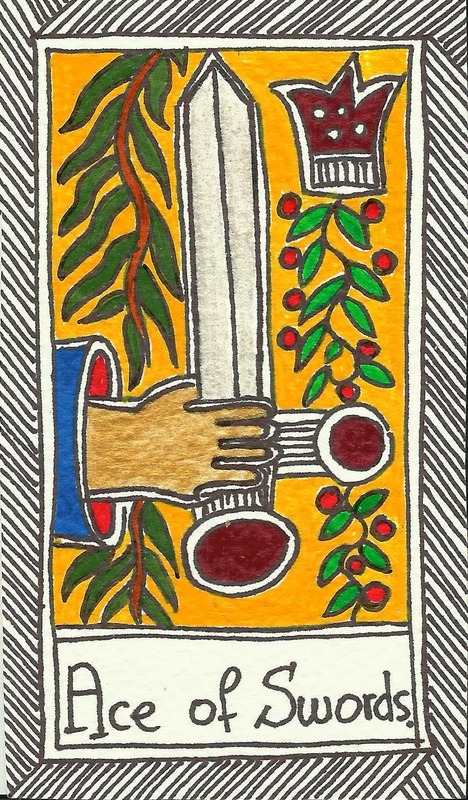 The Suit of Wands is analogical to the playing cards' Suit of Clubs. It represents the FIRE (masculine, active) element and it possesses all the qualities that FIRE does. 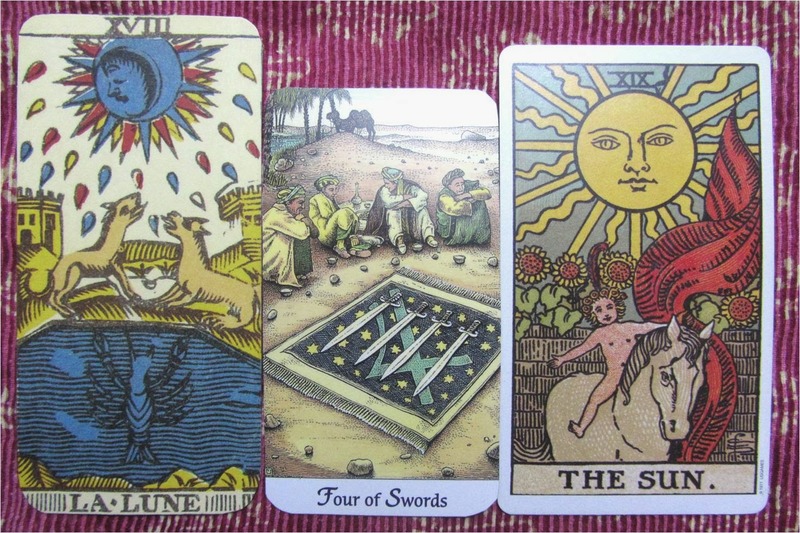 If the Tarot card layout has lots of Wands' cards, it may be talking about job, career, hobbies, ideas, clubs, experiences and situations related to enthusiasm, ambition, action, optimism, exams, career choices, struggle and competitions, speed and work. ACE is number one and according to numerology it represents beginnings (and endings). Suit wise, it means that beginnings are related to work, projects and career. It can symbolize new idea, new hobby, fresh start, new school, new business, inspiring project. It advises to focus on the goal and go for it! Number 3 is the number of expansion. 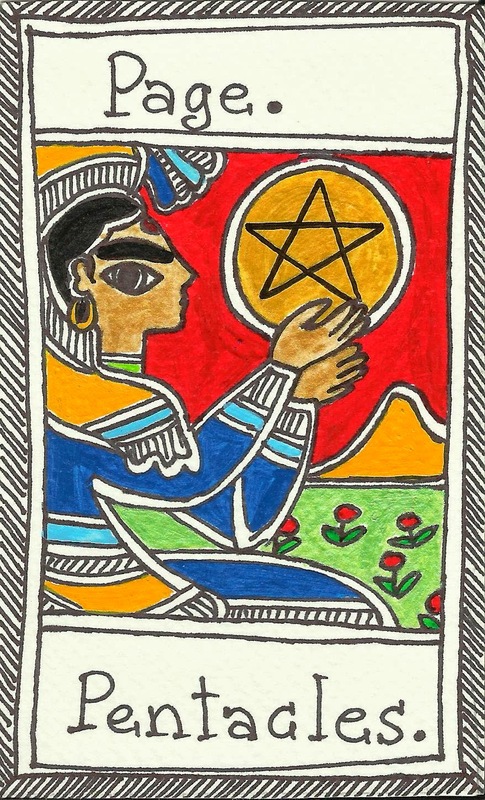 This card indicates that the projects have been successful and growing, the ideas have been successfully developing. It also urges to keep up what you have been doing and plan ahead! 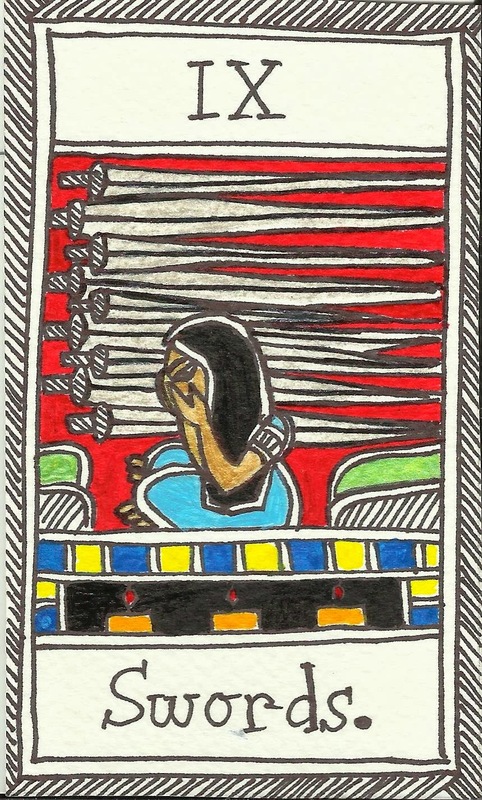 4 is the number of stability and the 4 of Wands symbolize security and stability at work, at home and within. It represents the feeling when we complete the work, finish the project, get a new house. It can as well symbolize the marriage and content family life. 5 is the number of activity and troubled areas. This number shows the weak areas and sensitive points. 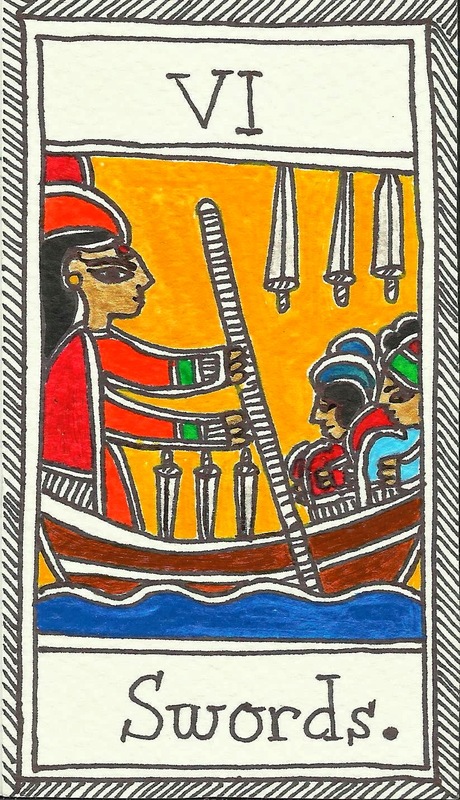 The 5 of Wands symbolize the healthy struggle, competition, discussion or a fight (with negative cards). 6 is the number of harmony and balance. 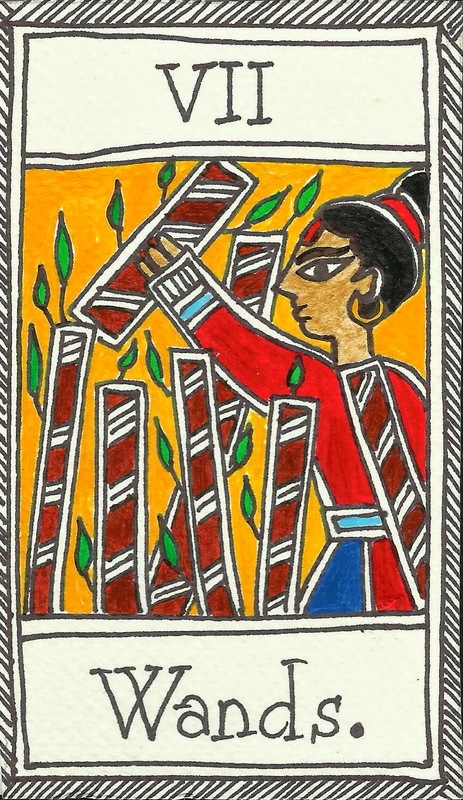 The 6 of Wands symbolizes victory, success, leadership, winning over something, overcoming something. 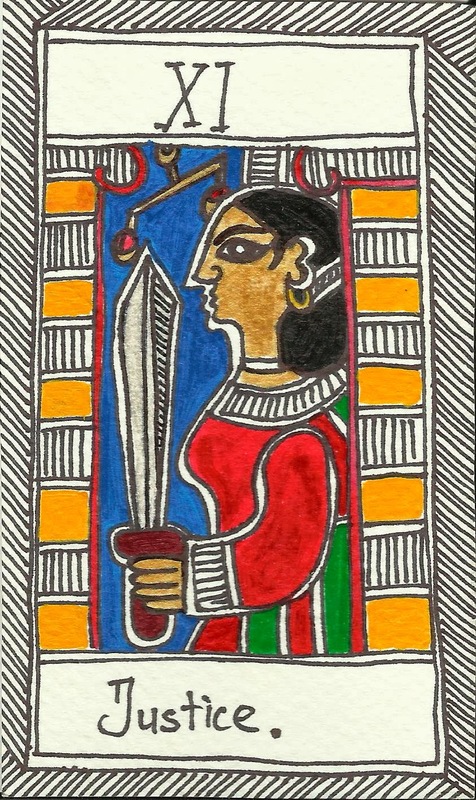 This card can also symbolize a person in a leader's role or who has leadership qualities. It can be a successful businessman, boss, celebrity or a dynamic successful person that people know and respect. This card is about standing up for oneself. It tells that one has been fighting/struggling hard and is on the way to success. It encourages us not to give up and stay as strong as we've been. This card usually means that something is happening very fast. A sudden action. A sudden start and end. This is the card depicts someone who has been trying hard and is not in a good shape. It wants us to stay strong and keep doing what we've been fighting for son long. Overwork, tiredness, inability to handle responsibilities. 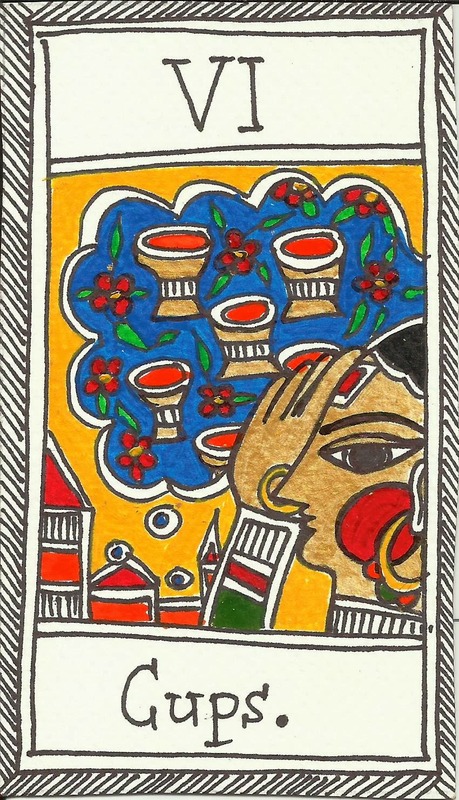 This card invites us to stop and think a little. Maybe we've been doing something that we can hardly handle? Page is the smallest in rank in the court of Tarot and he represents someone being unsure about taking certain steps. 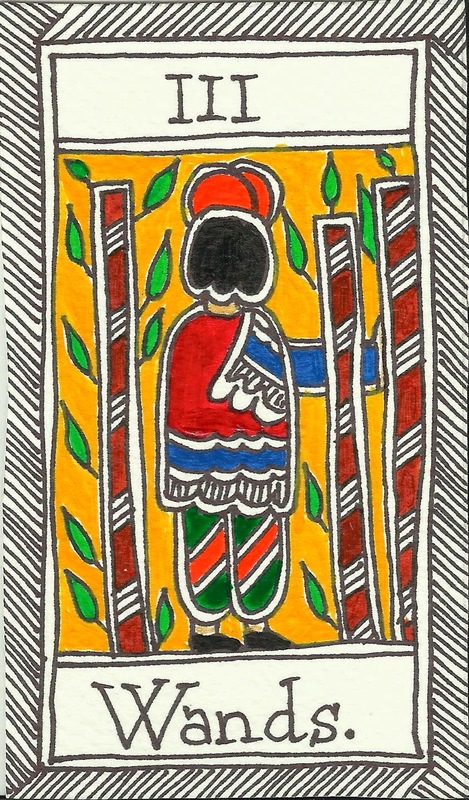 In career, the page of wands could represent someone who is doubting or is inexperienced. 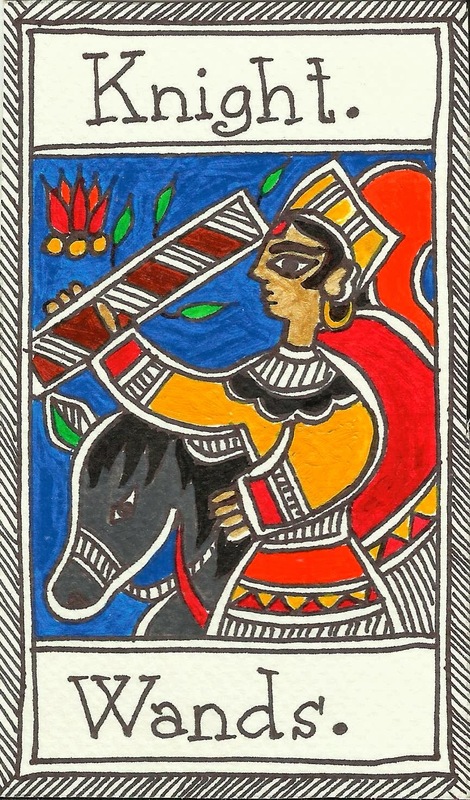 The knight is not present in the deck of playing cards and is one step below the queen. He represents someone who acts. It could be a young person or a person who acts in a youthful manner. Someone who actively and restlessly works towards his/her goals. The queen is the most knowledgeable and mature in her suit. 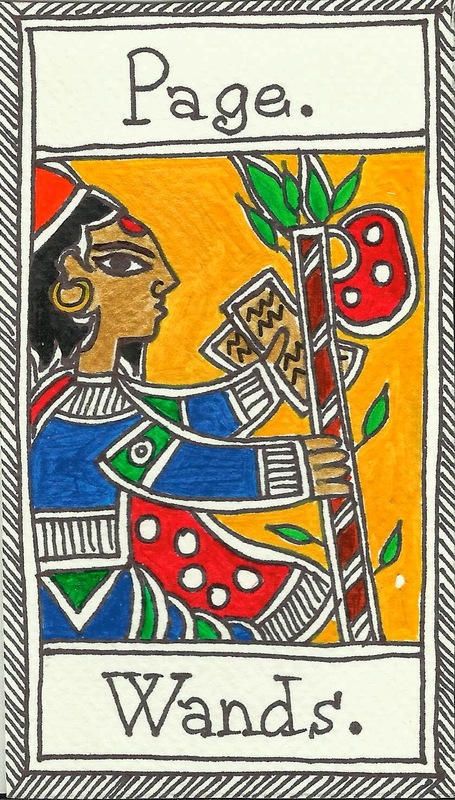 The queen of wands can be a woman, can represent the querrent or an energy. 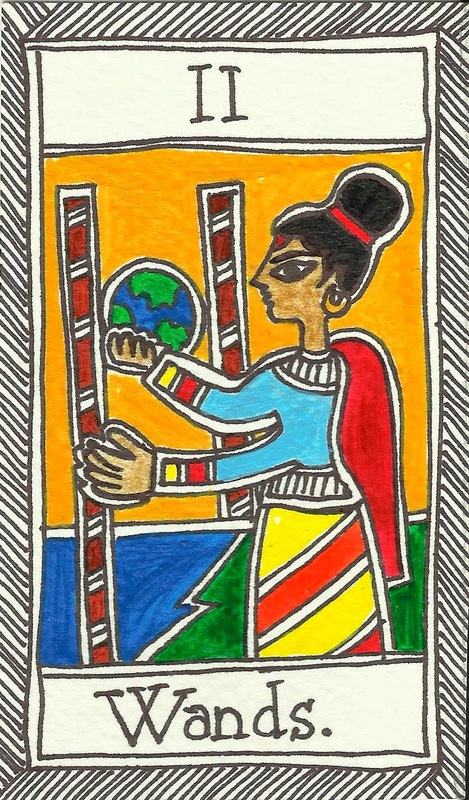 I would think of the queen of wands as a passionate and ambitious career woman, also a woman with many ideas, artistic woman. 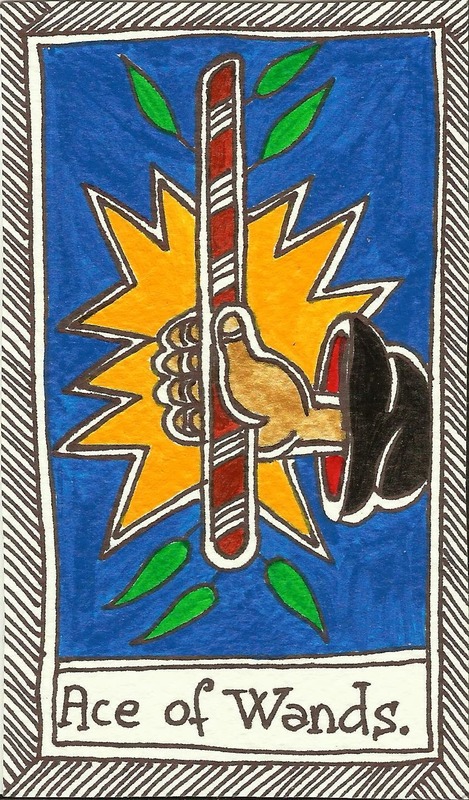 The king of wands would be a man who is mature or behaves maturely who is focused upon action, creativity and career. He would be a person with ideas or career oriented. A person who knows what he wants and is ambitious. Romantic relationship; Partnership; Friendship; Auspicious relationship. 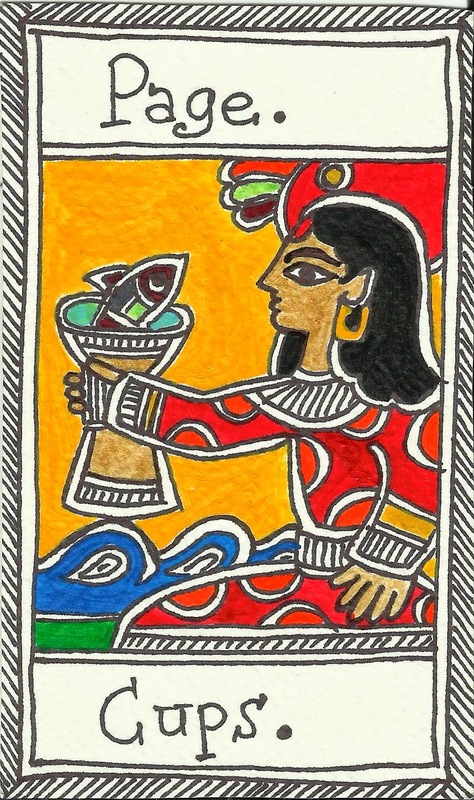 Wish card; Fulfillment of wishes; Attainment of all one wants; Lazy life style; Too many pleasures and good things. A mother; Daughter; Lover; Sister; A woman that is fair and loving; Emotional and good woman; Selfless and altruistic woman. That is it; The end; The bottom; Reaching the end. An intelligent young man, a child that has a sharp tongue is bright and clever. A man/child/girl of a very dark complexion. An intelligent and intellectual man who is rough and straight in his speech and can be of an aggressive nature. Someone intimidating. Of a very dark complexion. A widow, an old woman, a woman of a very dark complexion. A woman who's IQ is higher than usual, very smart and intelligent, perfect communicator. Might lack empathy and like gossips. A mature man of a darker complexion. Might be in military, police or law and wear a uniform. He might be disciplined, elegant and intelligent but unapproachable. Give and take; Favors; Gifts; Exchanges; Codependency; Duty of giving/taking; Dividing the right share; Any in between relationship (can be digestion). Family and ancestors; Generation to generation; Heritage; Grandparents and grandchildren. A housewife; A cook; A practical woman that loves gardening and nature; Someone who is interested in home/herbal remedies and wants to make one fat by feeding; Caring and rich woman. A mature man that is practical, grounded and financially well off. He is reliable and down to earth. 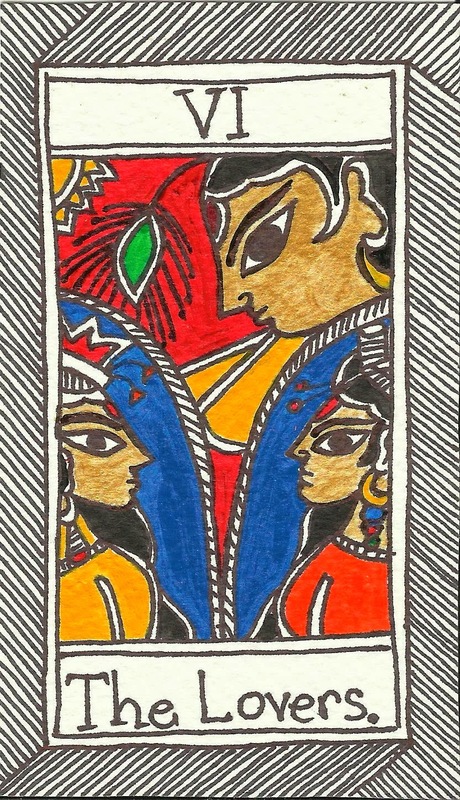 I was going through google to find some information on madhubani and saw your site. it was very informative. 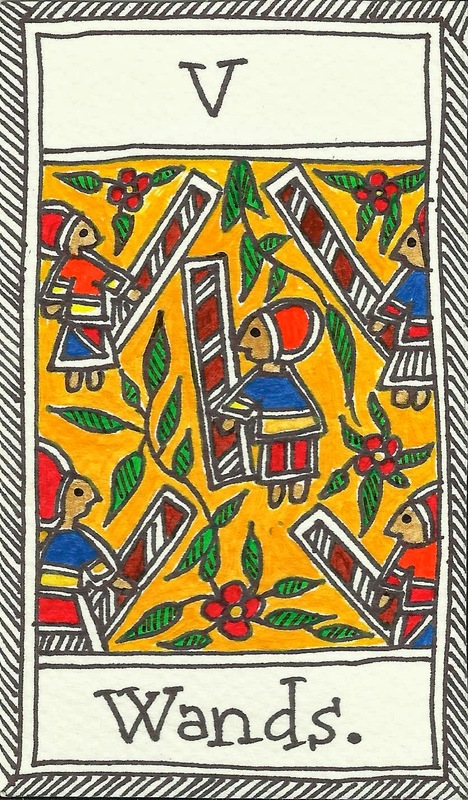 I really like madhubani paintings, I am from Bihar.Once in a while i do want to make a simple one, but really find it very difficult. I mean those faces, patterns, those intricate flowers, all so clinged , i dont knwo i dont have such a creative hand. is there any way to make a good simple painting for a beginner. Also can i use normal black gel pains for borders. whenever i see the paintings i feel no , this is too complicated i cannot make. Warli seems to be much easier. please do keep writing. its really good to see someone being so passionate about their art. Thank you, Butterfly Thoughts, for commenting! 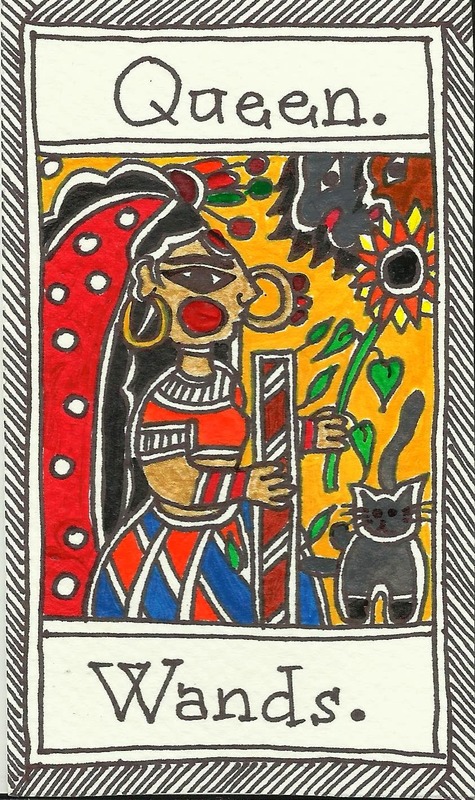 Indeed, some of Madhubani designs can be very hard, I also struggle with face and body proportions and animals too! 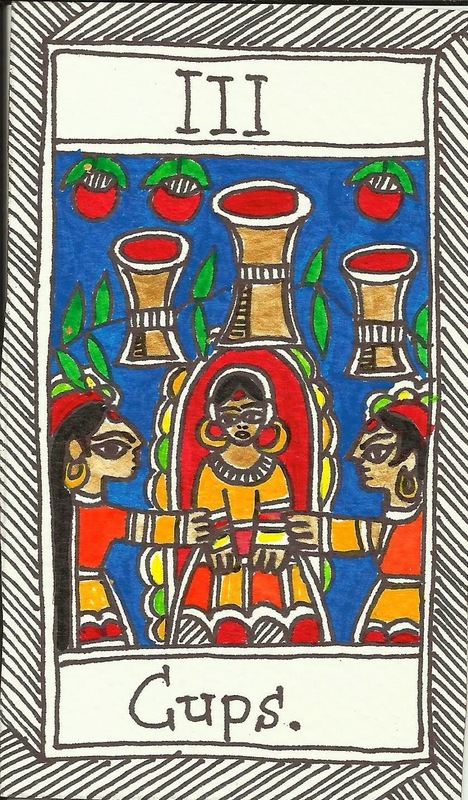 I will try to post a simplified Madhubani for someone who wants a really simple painting!!! Have a great day! I love Bihar! 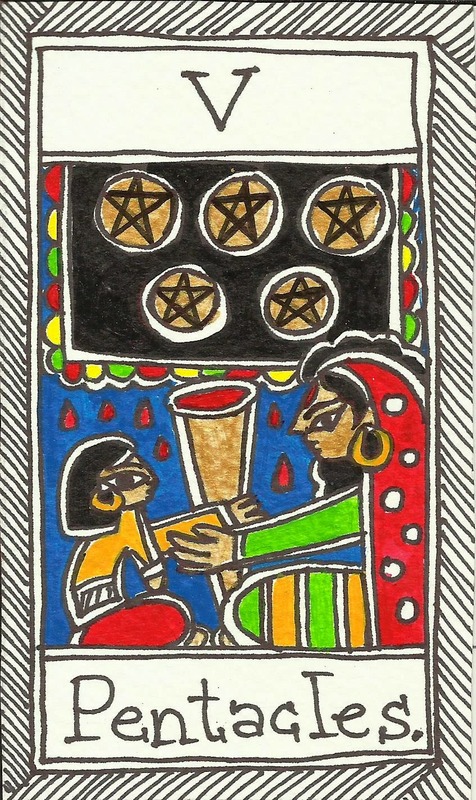 Great work,I saw your video,no one ever think that you are making Tarot Deck for the first time. May I know how much time did you take to design a single card and how much time for the entire collection? Thanks, Mayank. 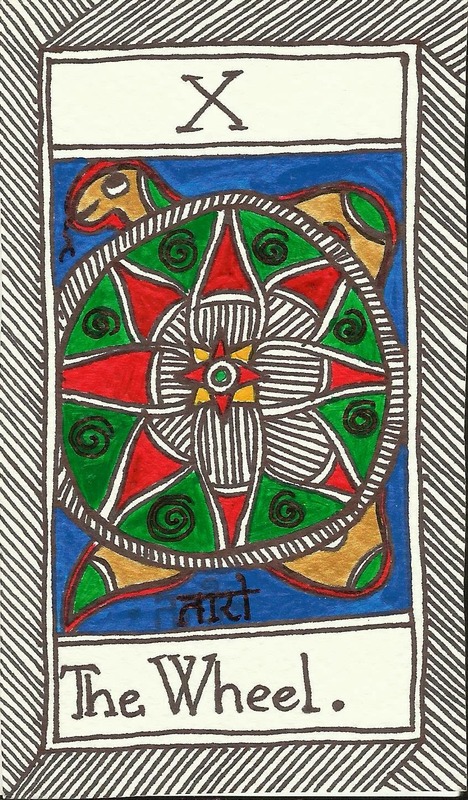 It took about 10 mins to design one card, about 20 mins to color by computer and the whole deck took 2-3 weeks (some day 10, some day 20, some day none). I started this a year or so ago but it was unfinished, then I remembered and finished it. Many cards are still uncolored though and I want to remake some. 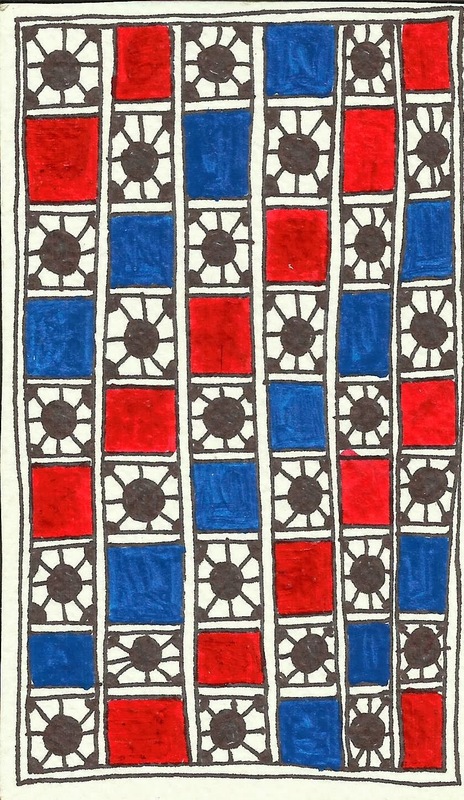 'Color by computer'...I could't get it.I mean you are drawing it by hand in small rectangular paper then how can you color it by computer? Do you scan the drawing and then use some photo editor like paintbrush or photoshop to color it. Yes, I used the free software after taking photos of each card. You are something, all heart, I am a Tarot card reader and must thank you for the wonderfull job , I love you. Well first of all the paintings that you have mention in the post is really very good and beautiful and I too used to do while any function took place in home. I will also try for the design.